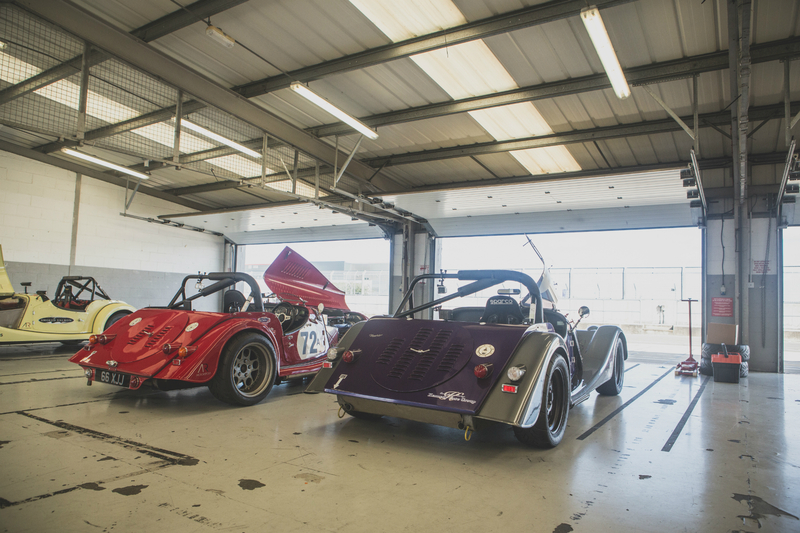 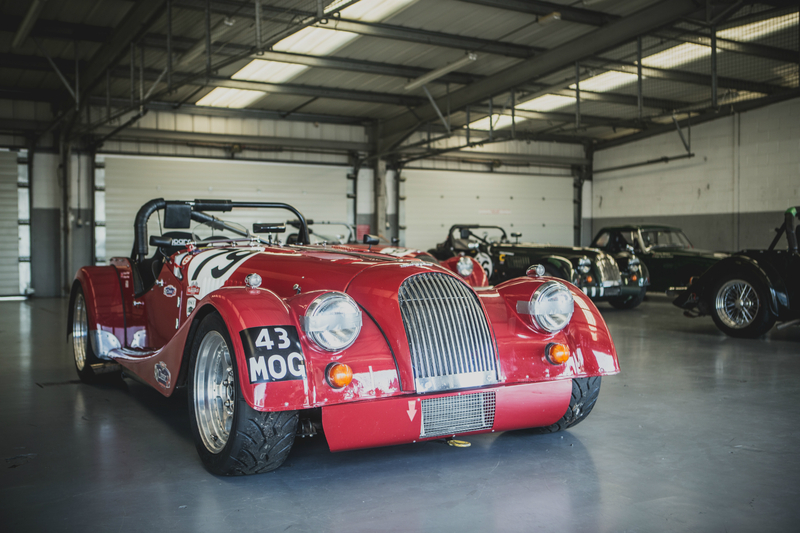 After a brief summer break and a trip to Angelsey for the Morgan Challenge, it was back to Silverstone for the third time in the 2016 season. 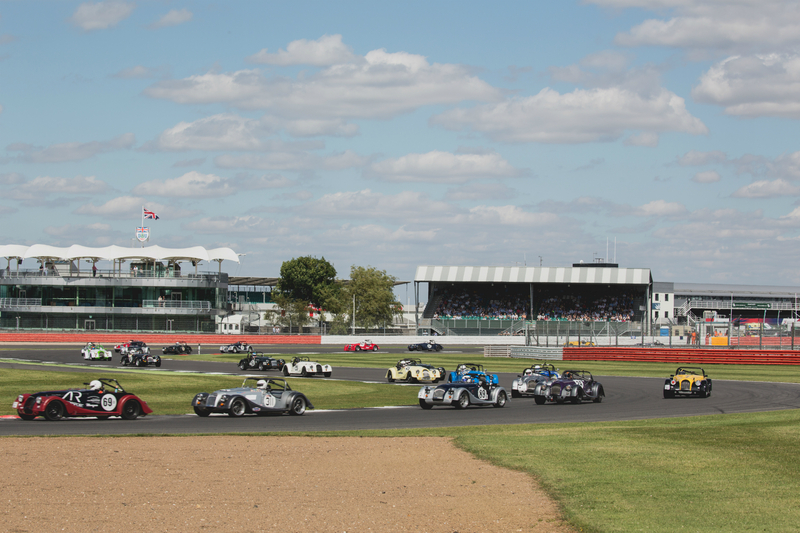 This time the 35 car grid would compete on the National Circuit as part of the Bentley Drivers Meeting. 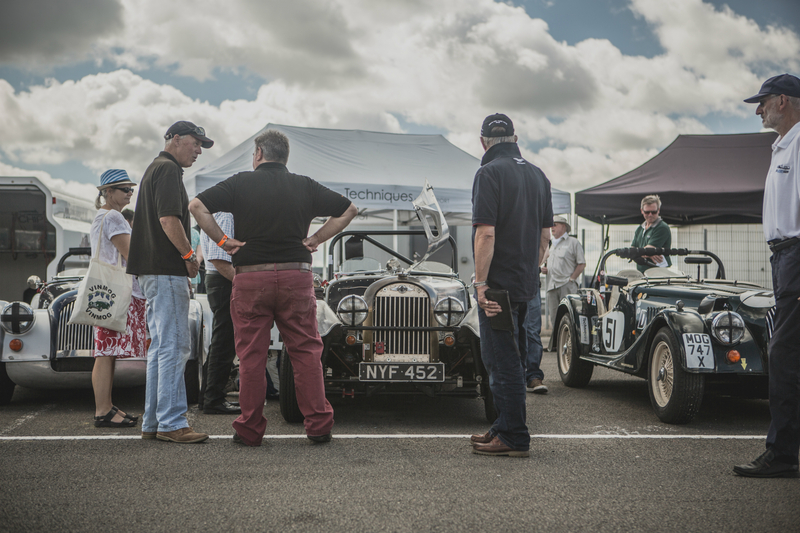 A highlight of the calendar, the Bentley Drivers Club meet is always well attended from both the Bentley and Morgan communities, and demonstrates some of the most prestigious Bentleys throughout the history of their company. 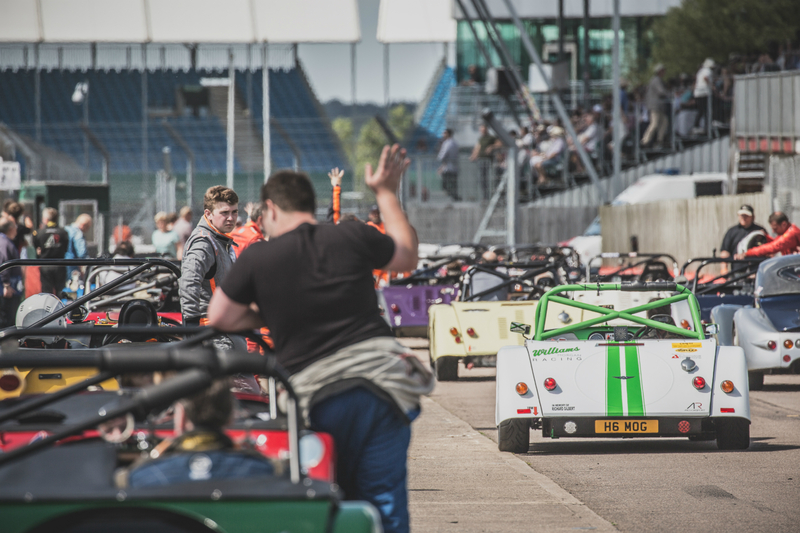 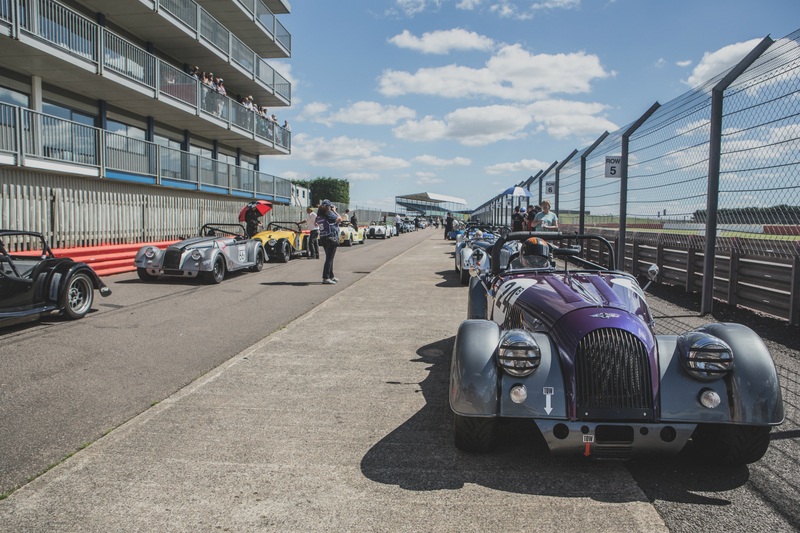 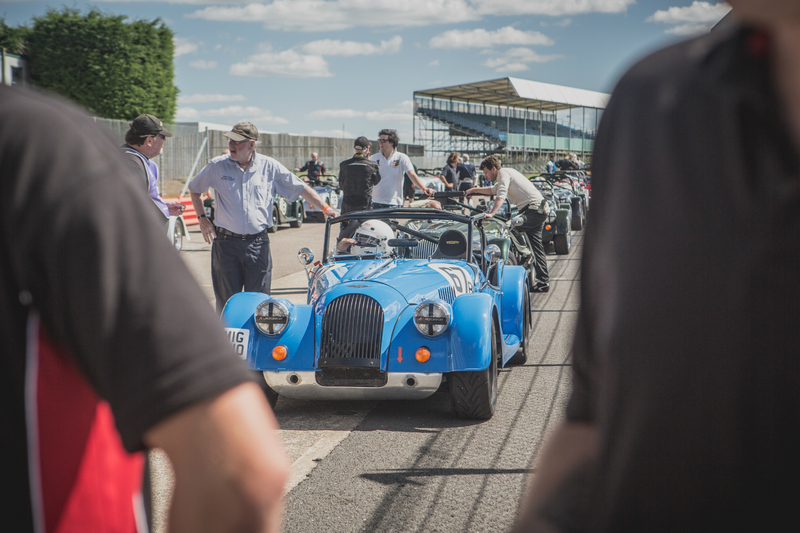 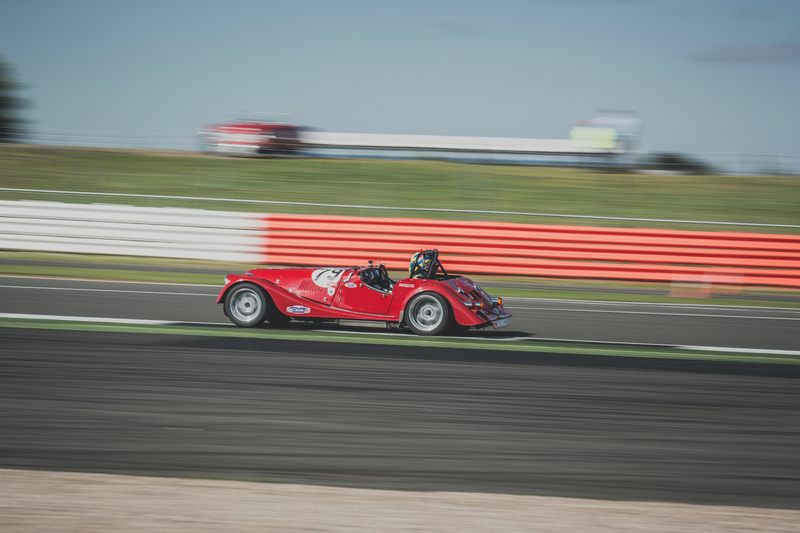 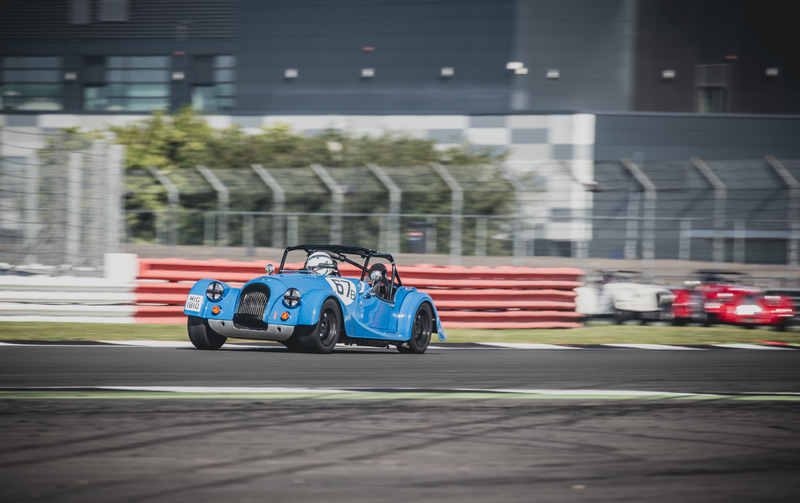 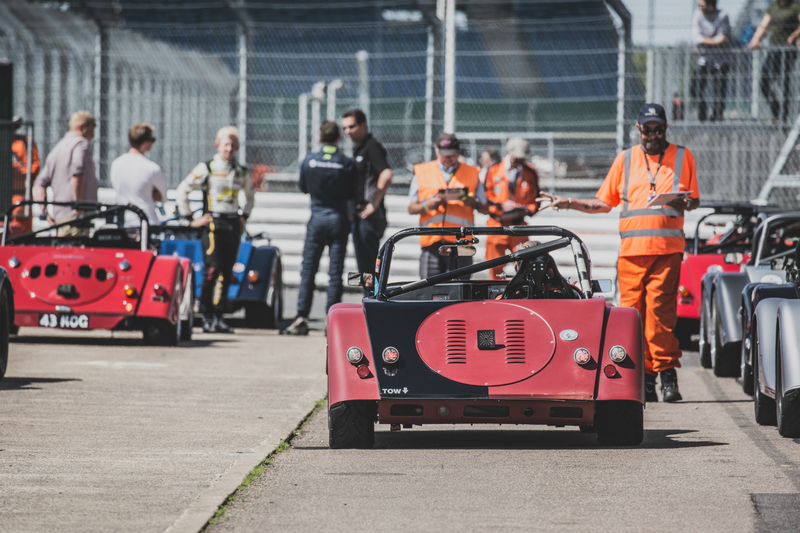 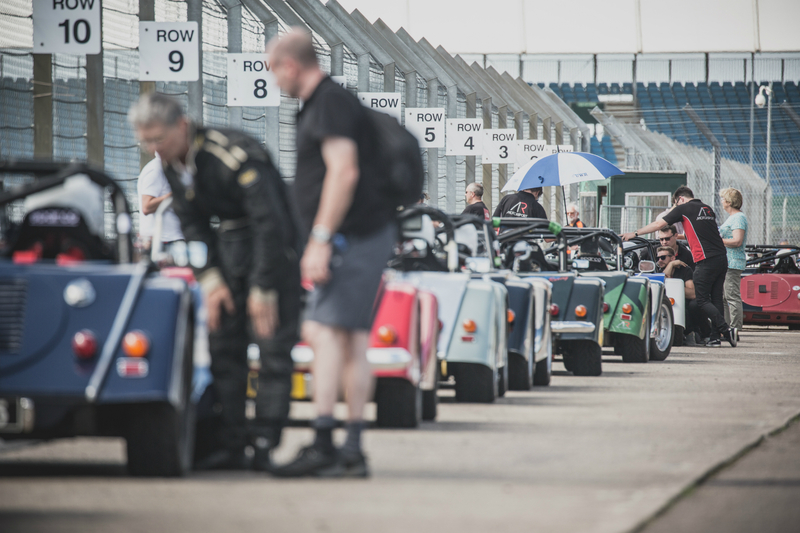 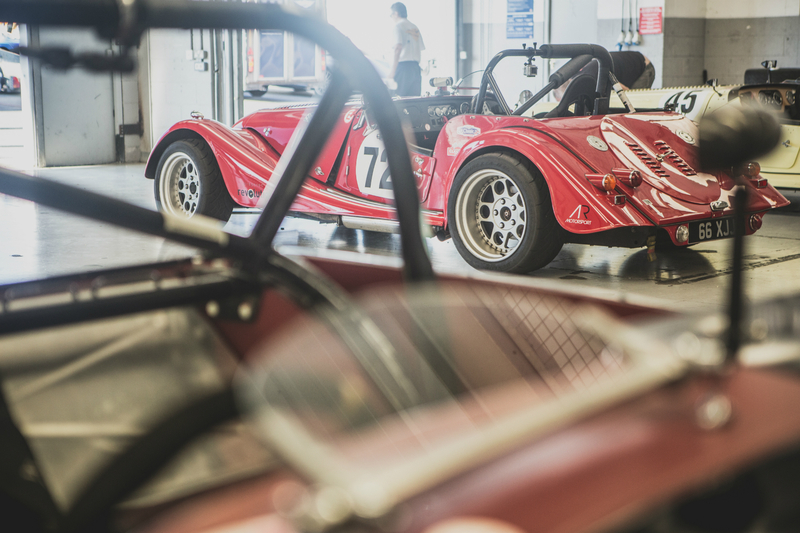 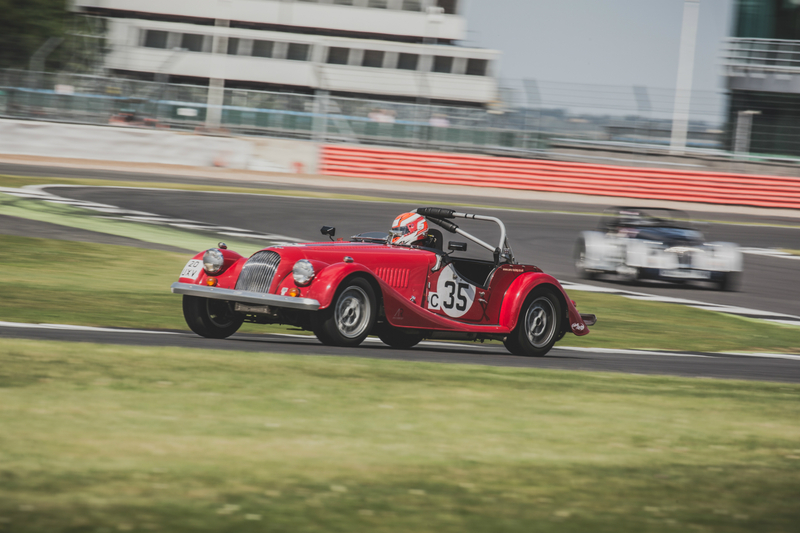 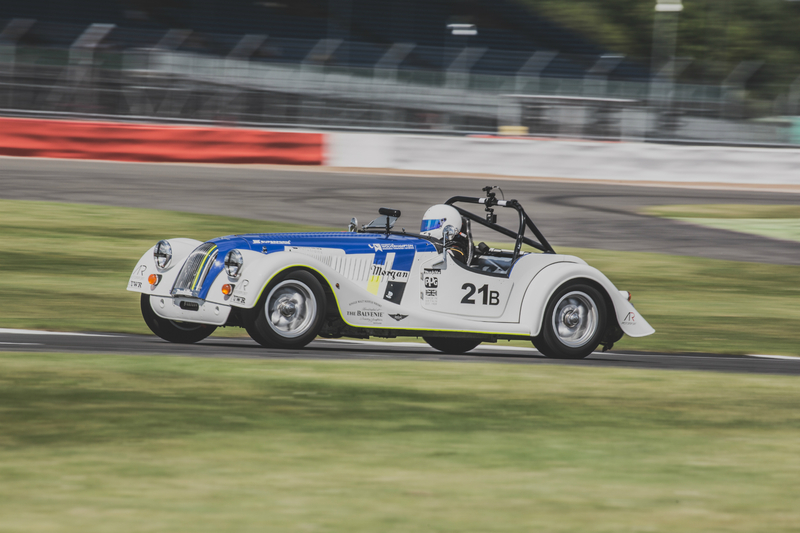 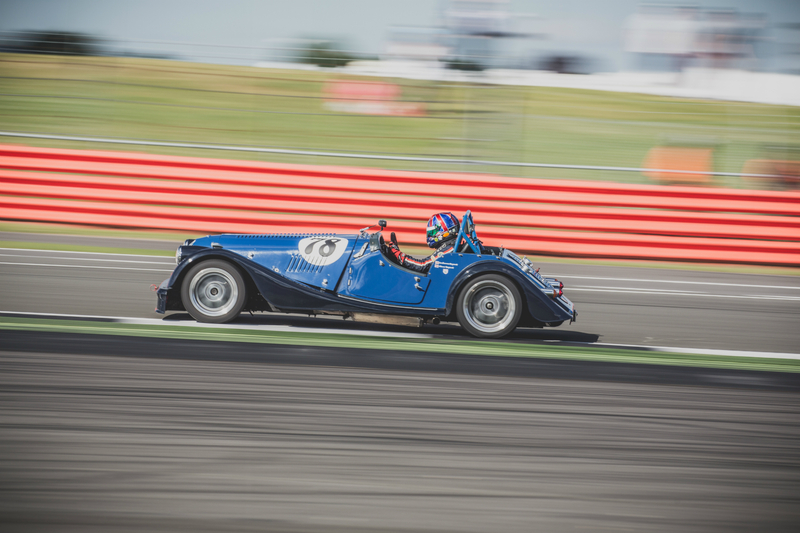 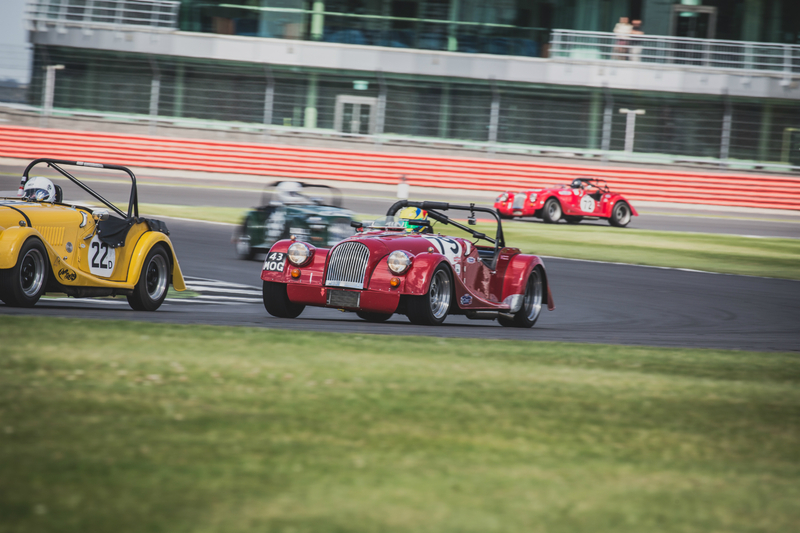 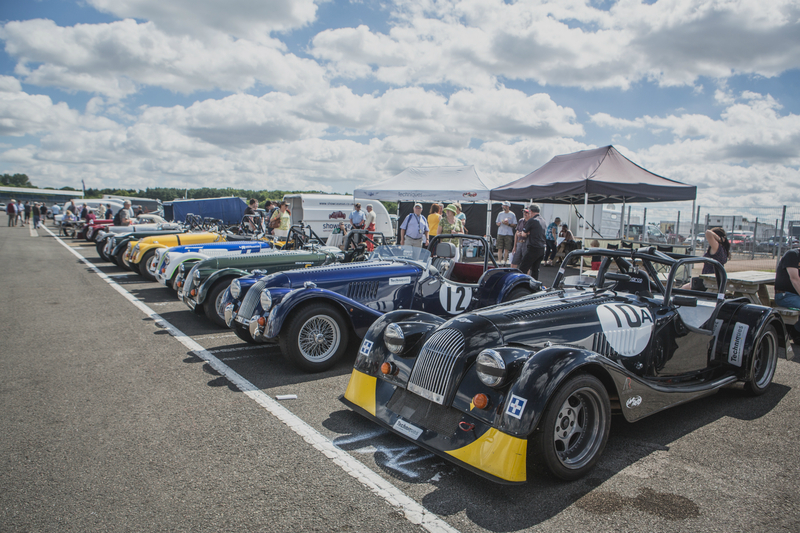 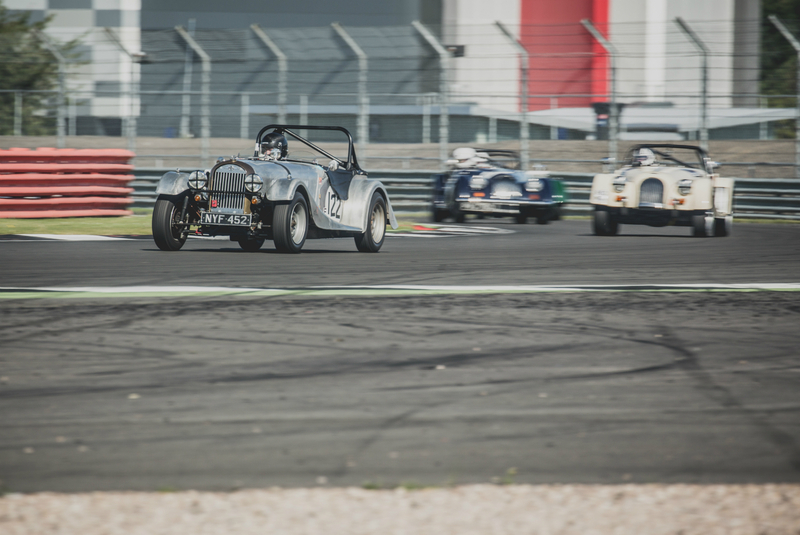 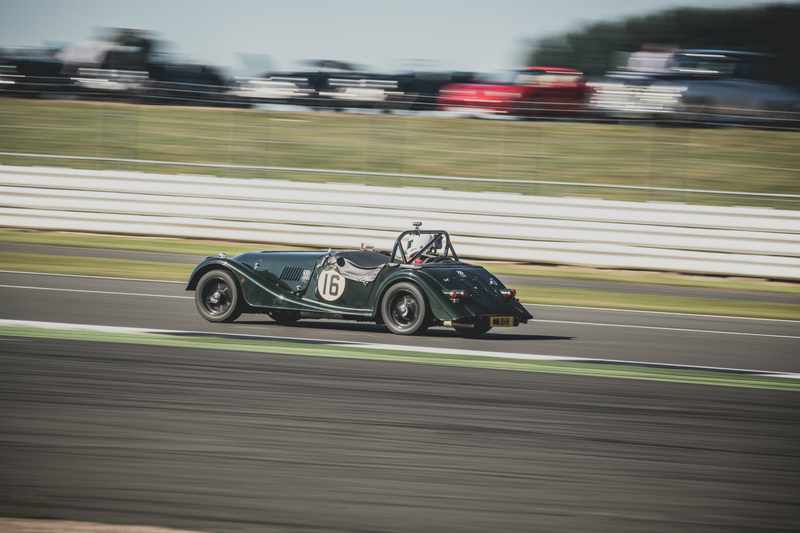 For many years the Morgan Challenge has featured as part of the BDC meeting, and for 2016 the weather had certainly been ordered, with beautiful sunshine engulfing the home of British motorsport. 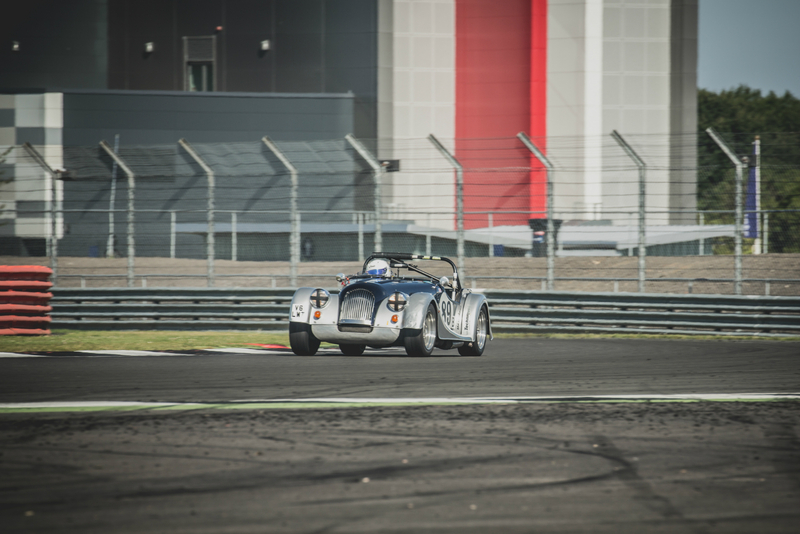 After a brief summer break and a trip to Angelsey for the Morgan Challenge, it was back to Silverstone for the third time in the 2016 season. 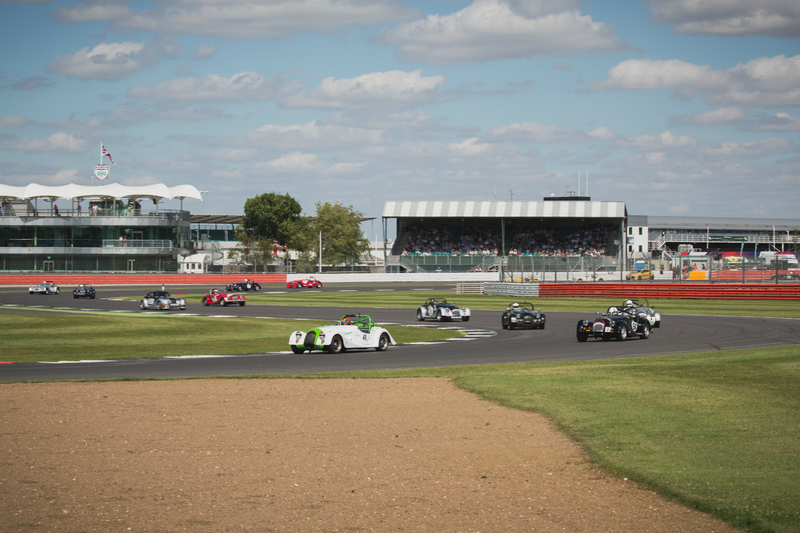 This visit would see the 35 car grid compete on the National Circuit as part of the Bentley Drivers Meeting. 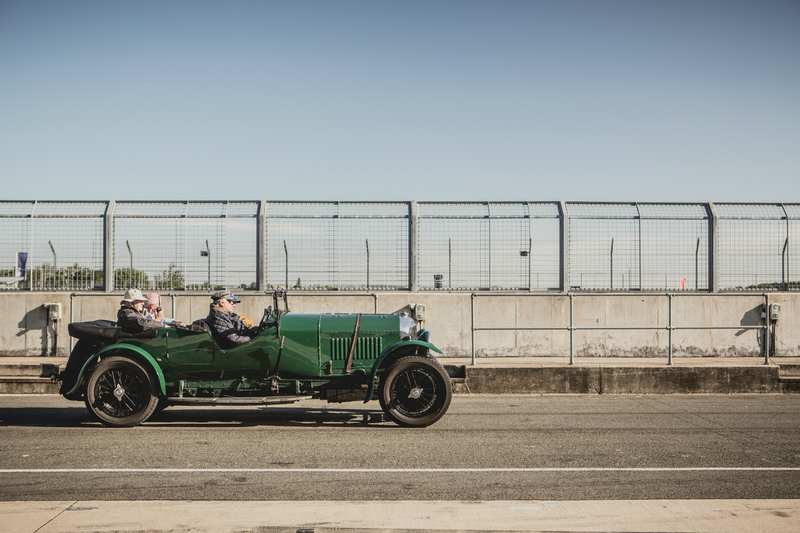 A highlight of the calendar, the Bentley Drivers Club meet is always well attended from both the Bentley and Morgan communities, and demonstrates some of the most prestigious Bentleys throughout the history of their company. 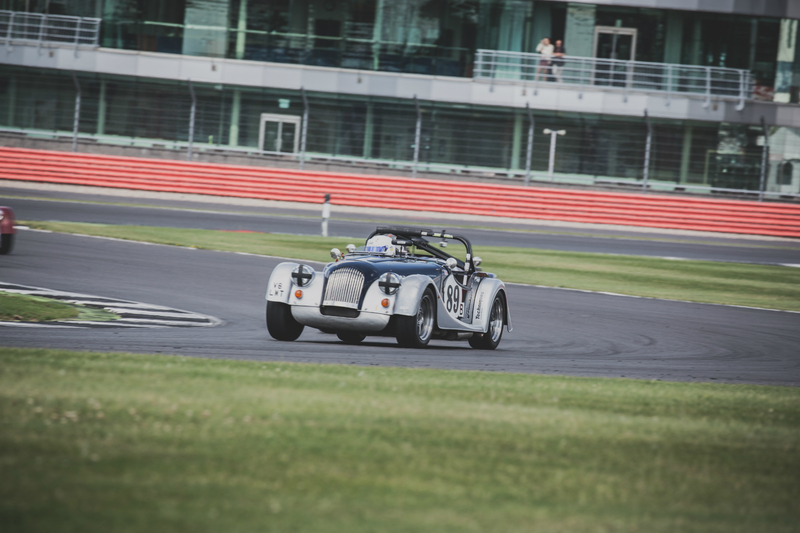 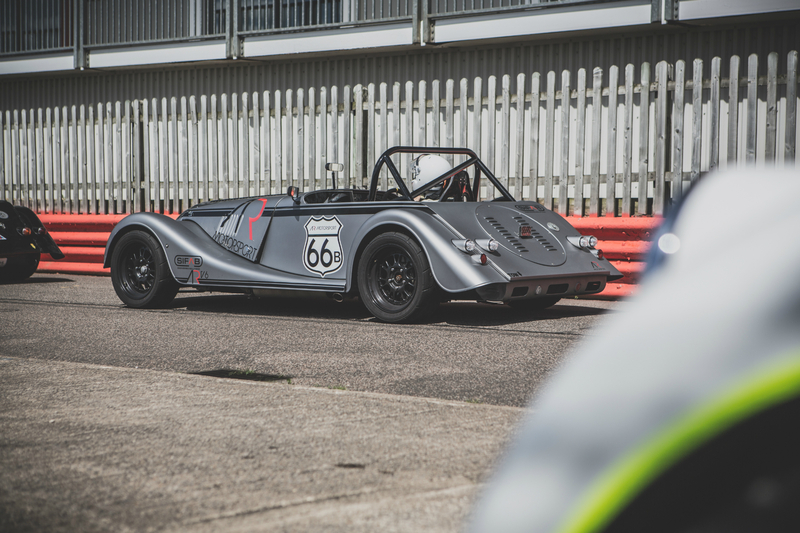 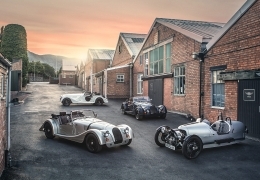 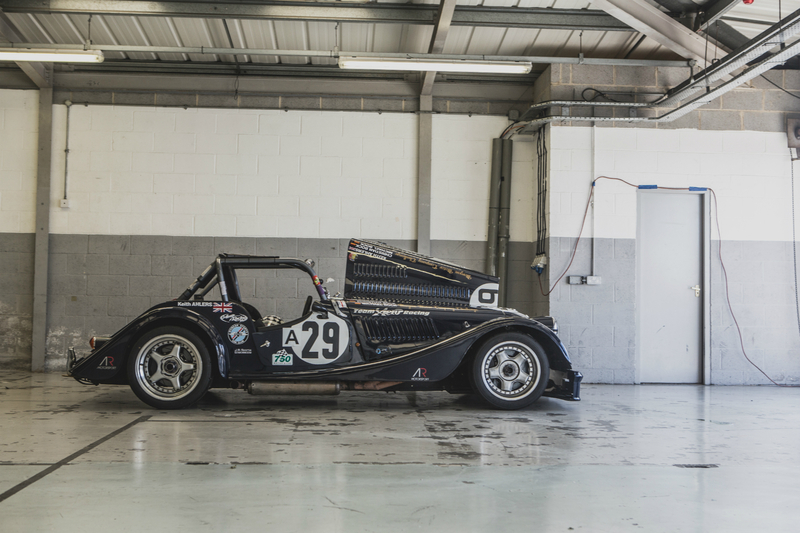 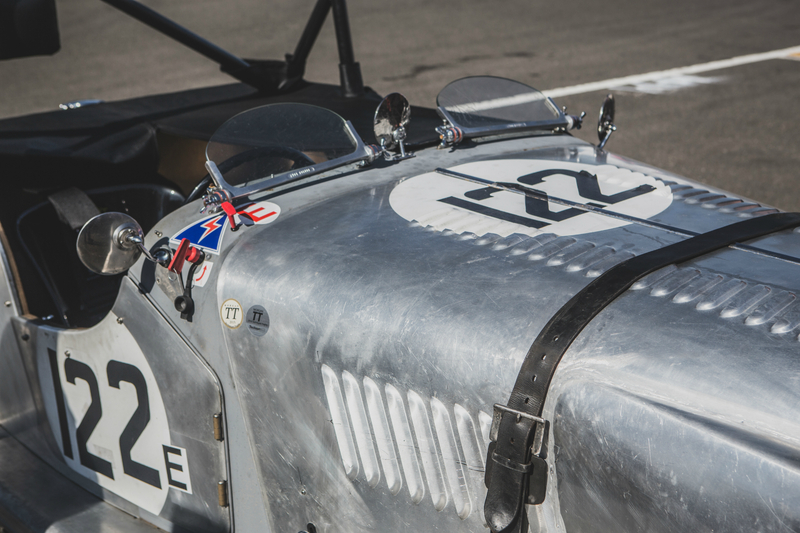 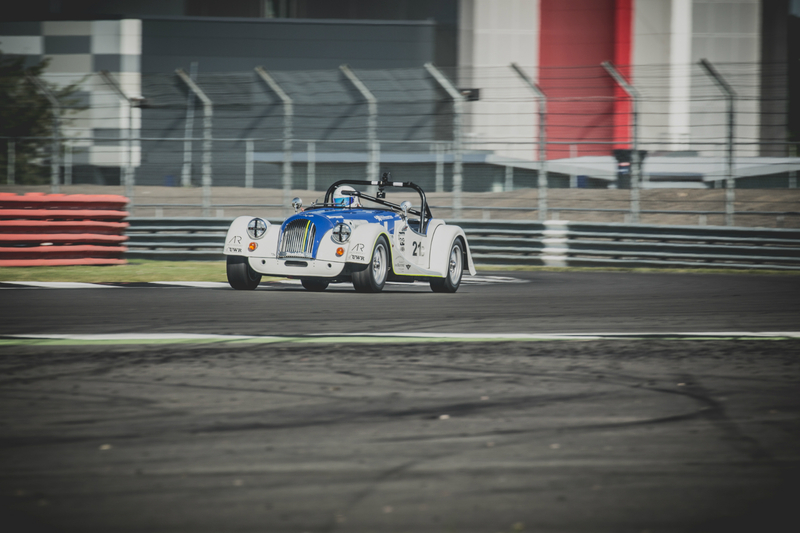 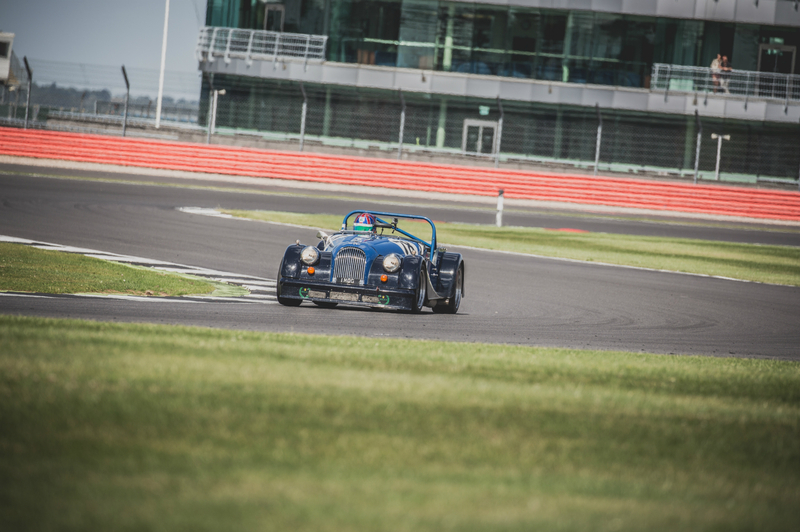 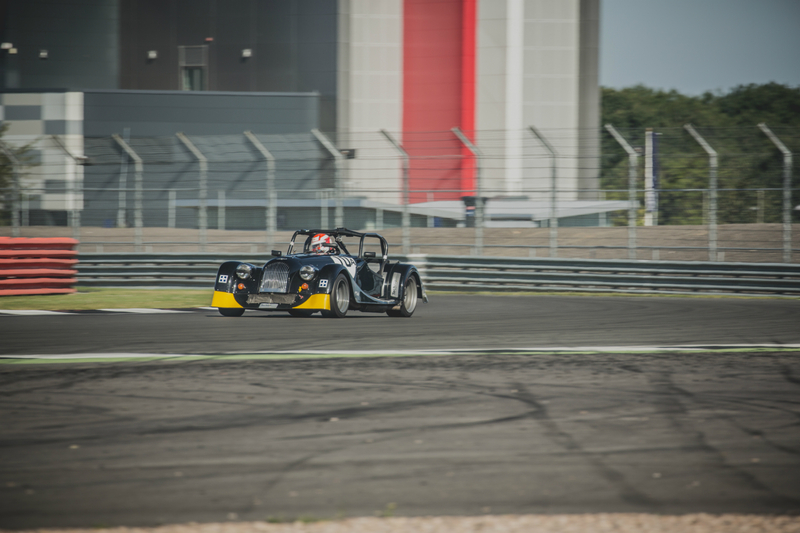 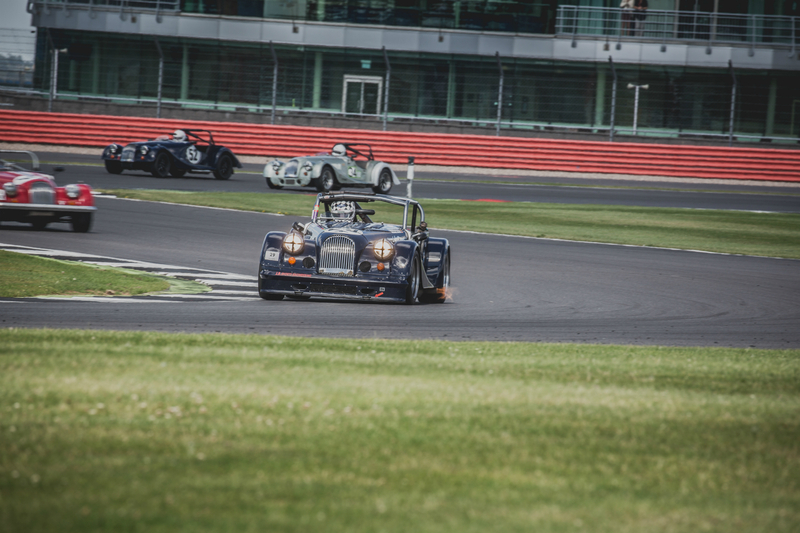 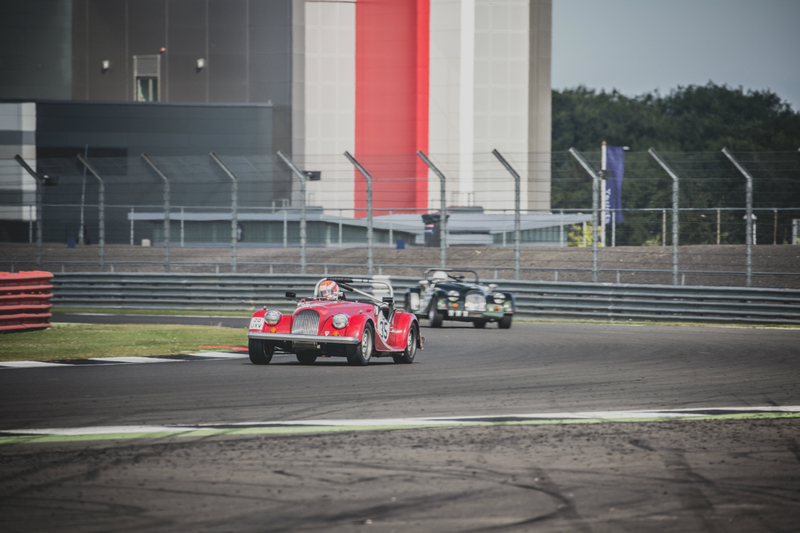 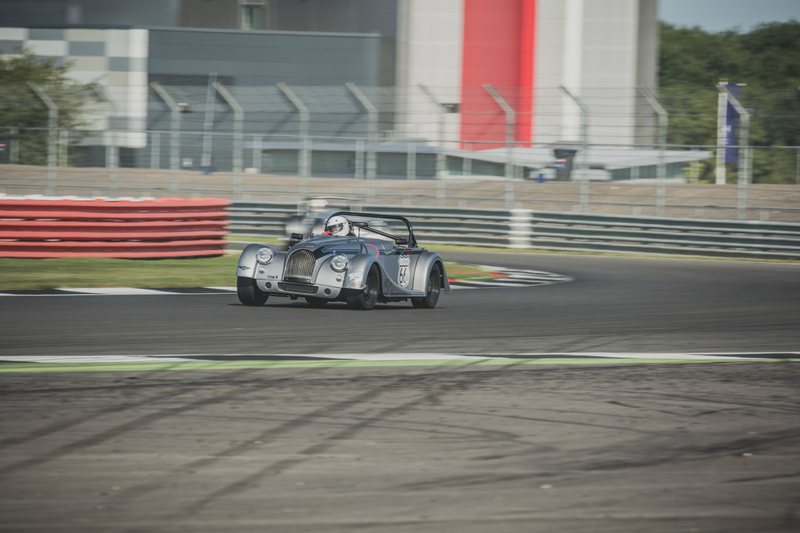 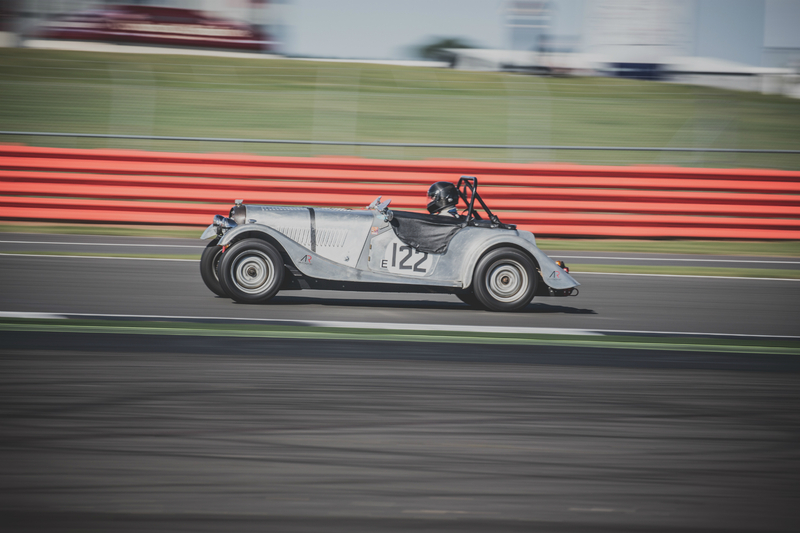 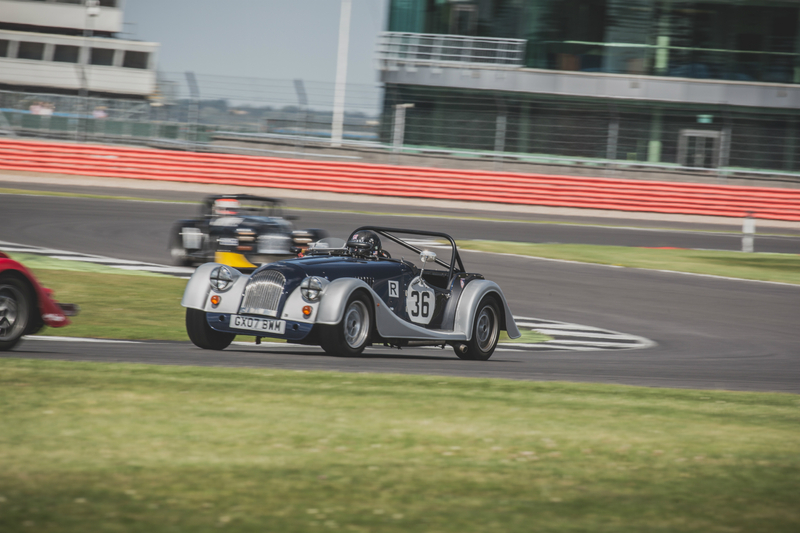 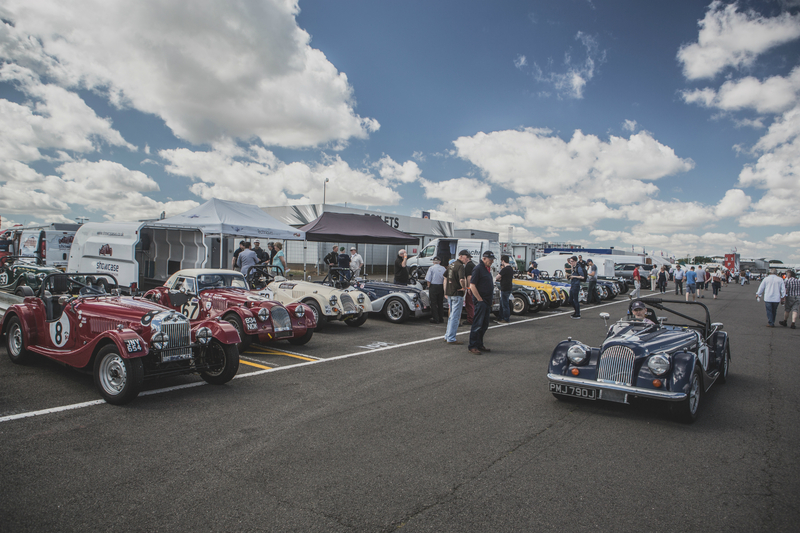 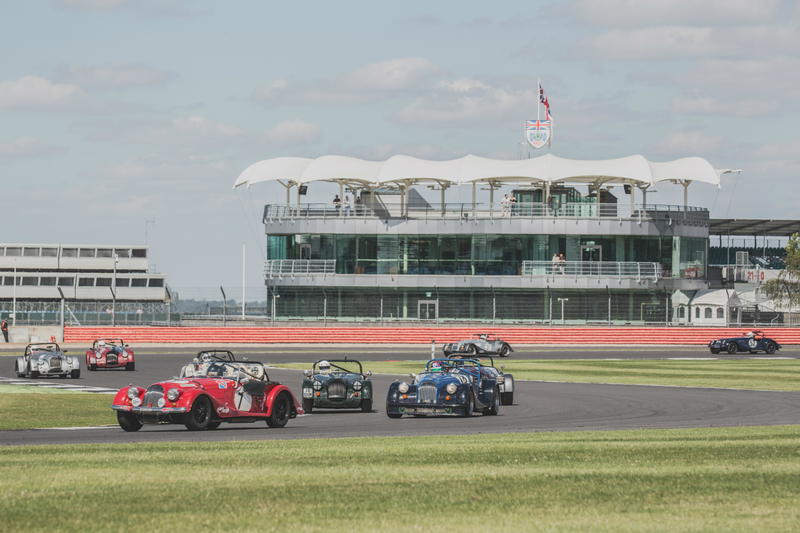 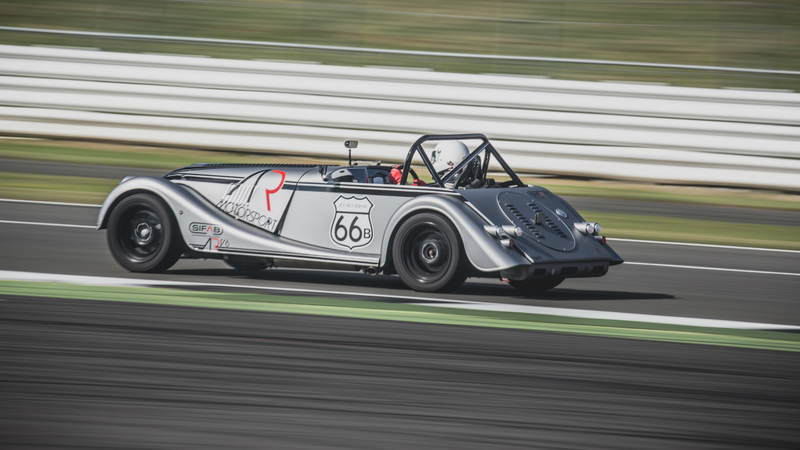 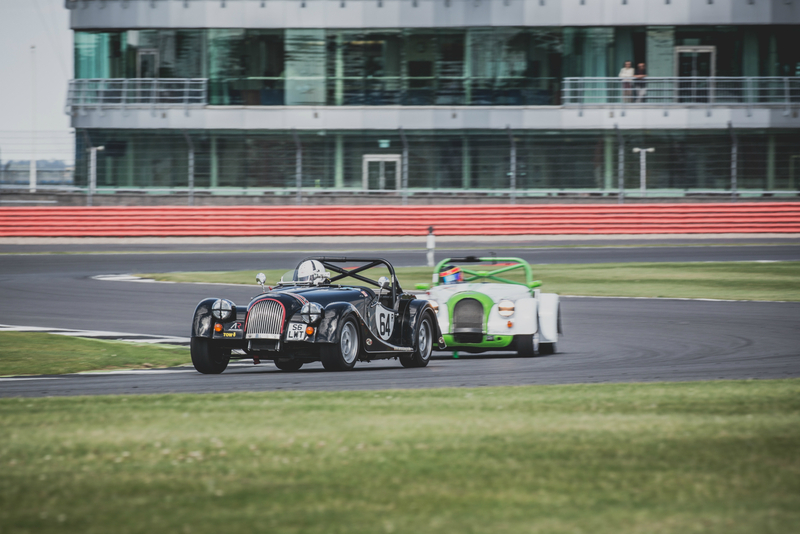 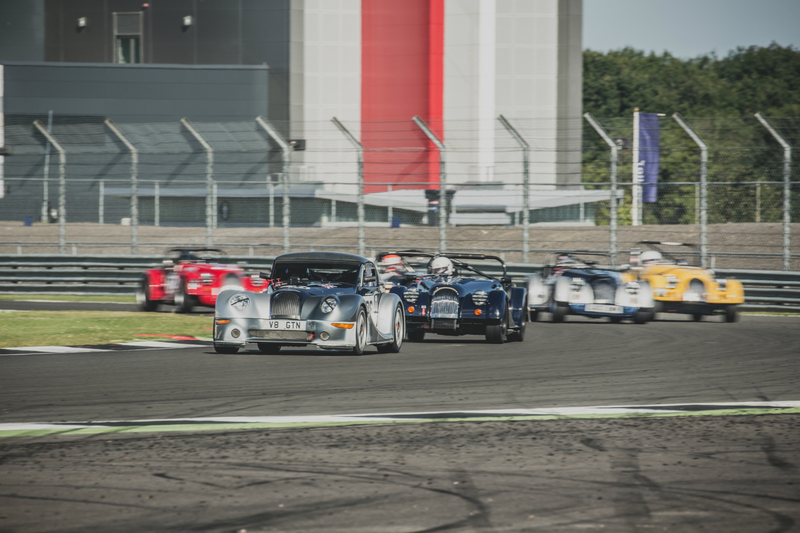 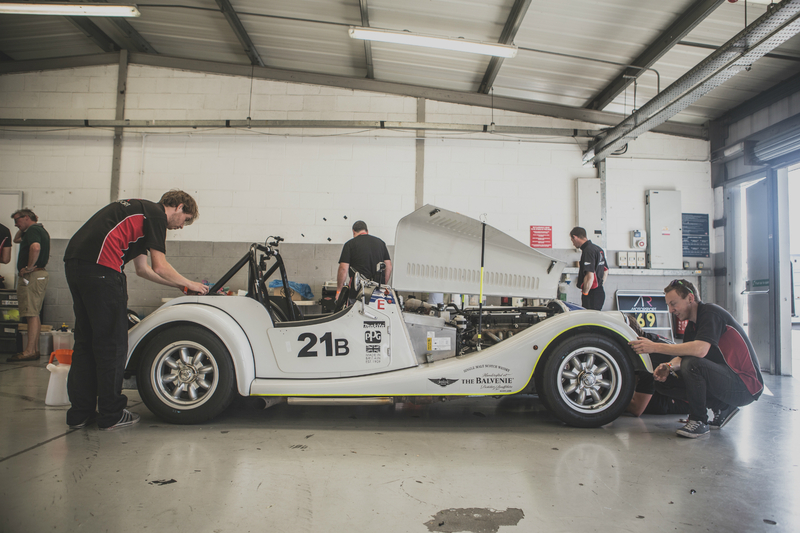 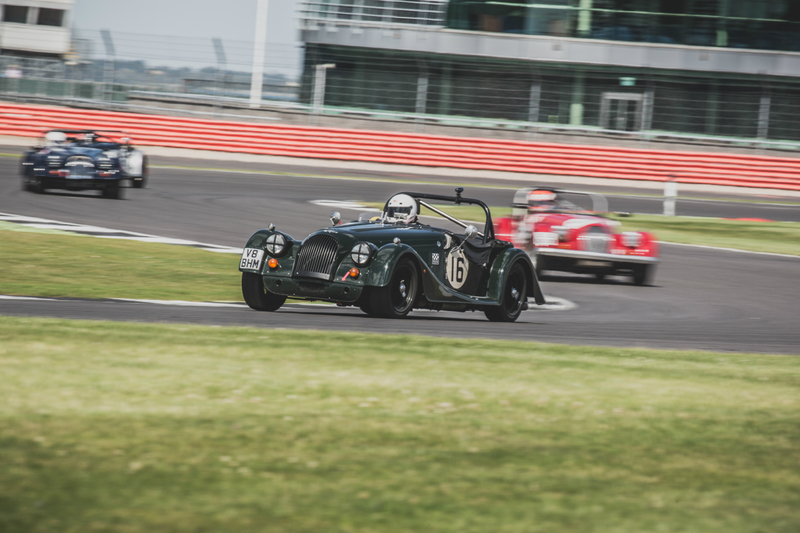 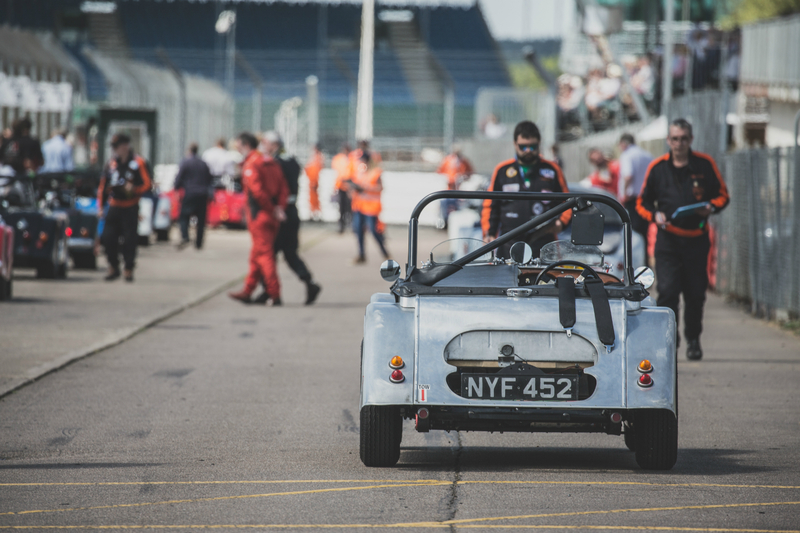 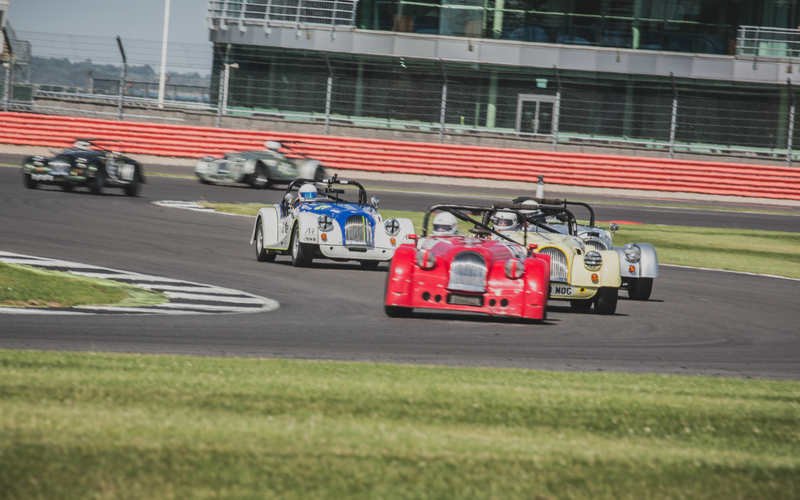 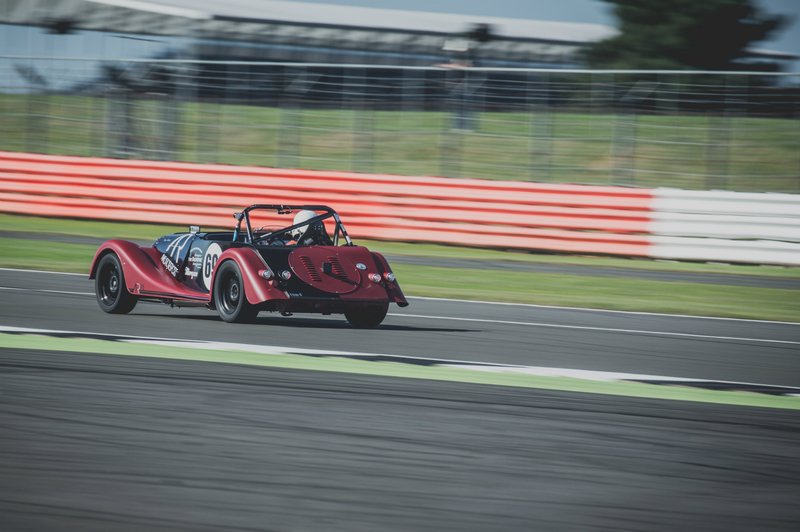 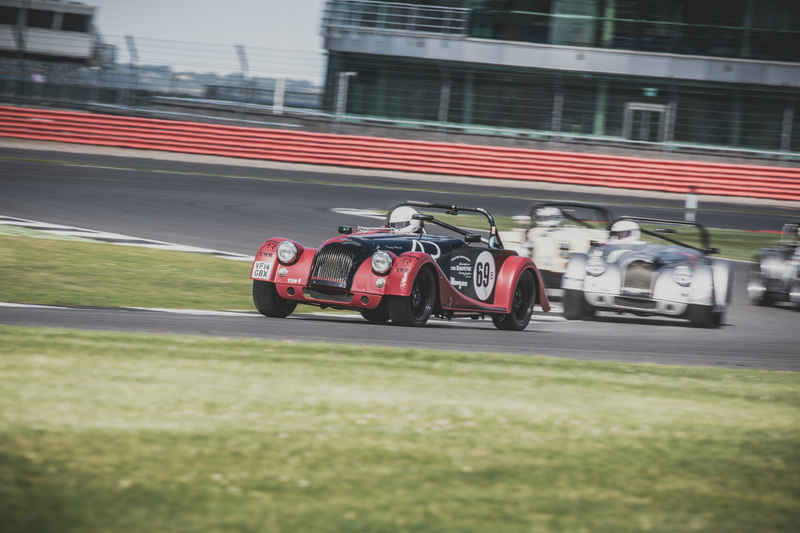 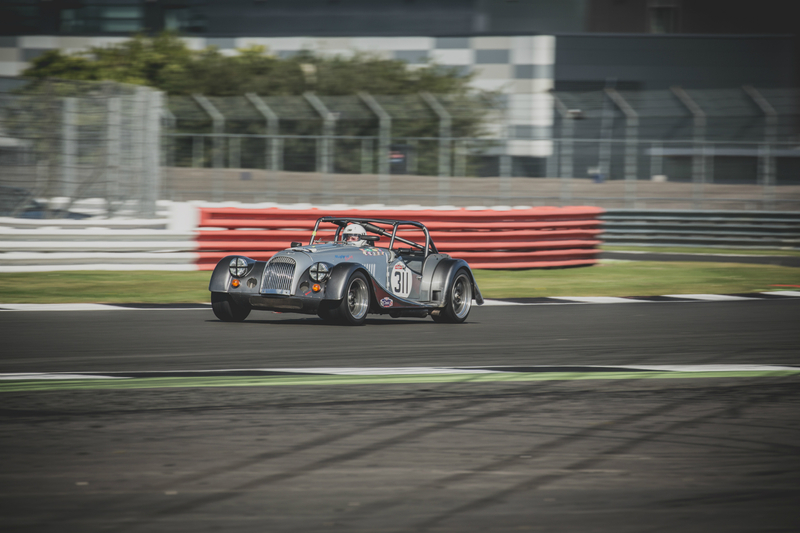 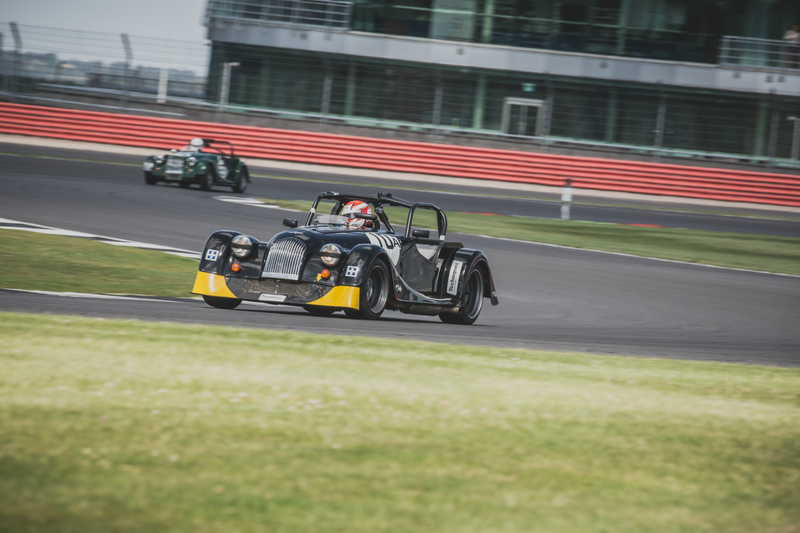 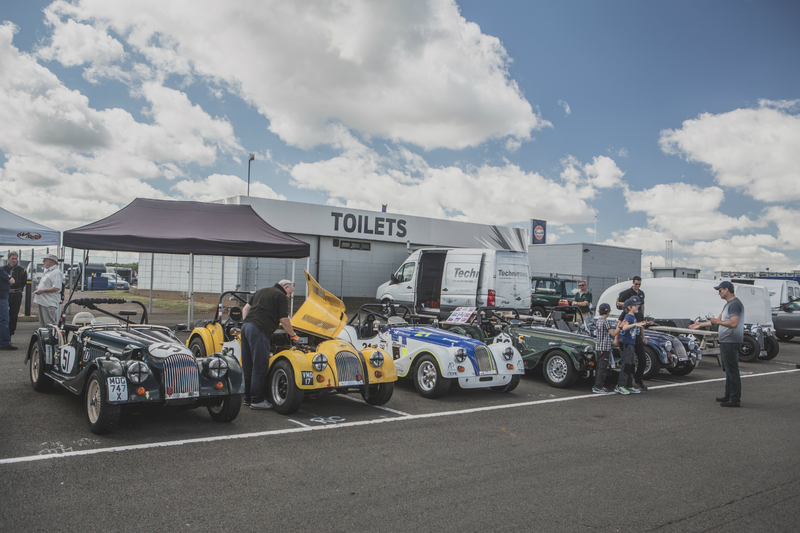 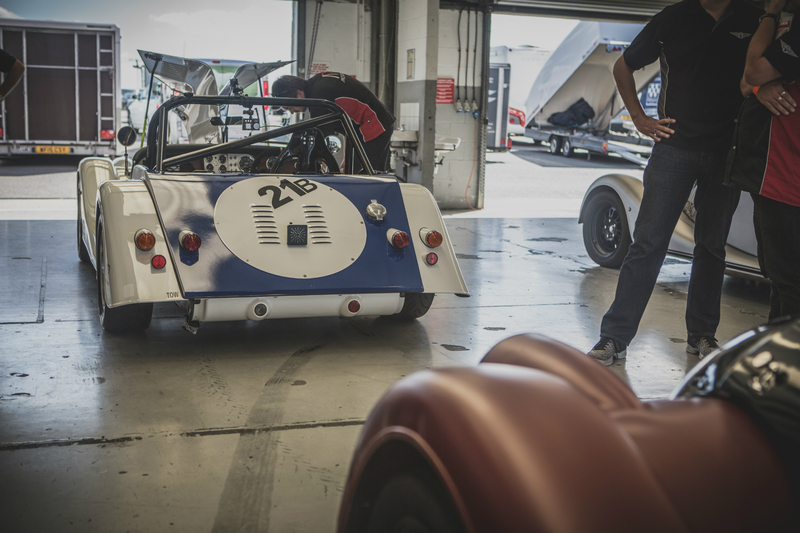 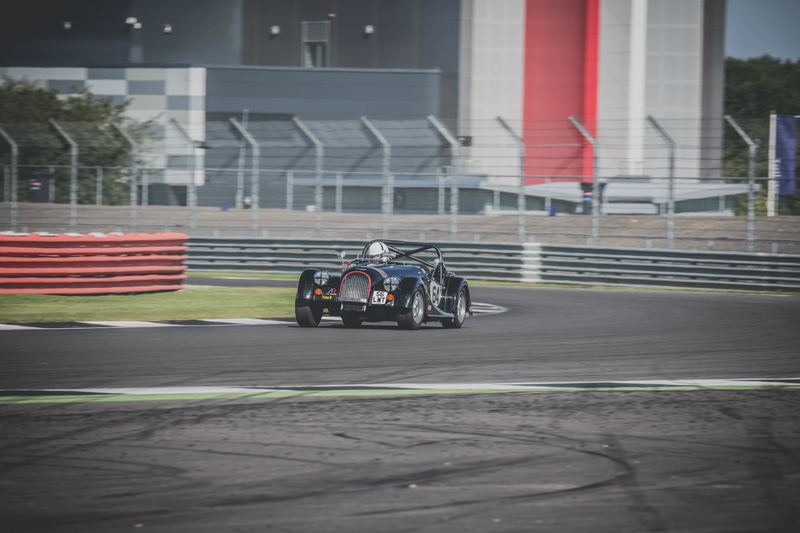 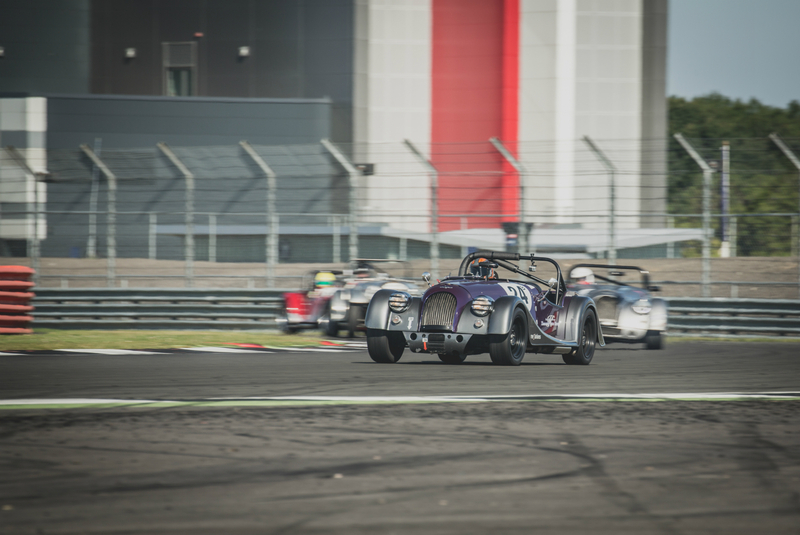 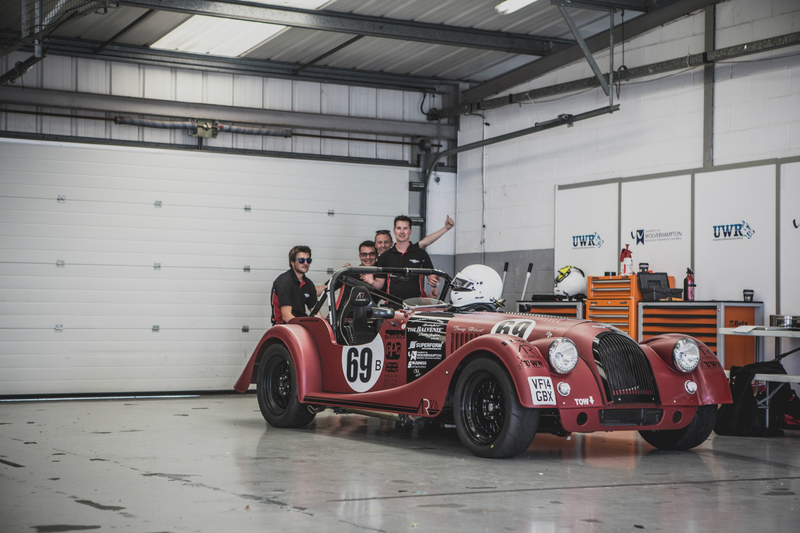 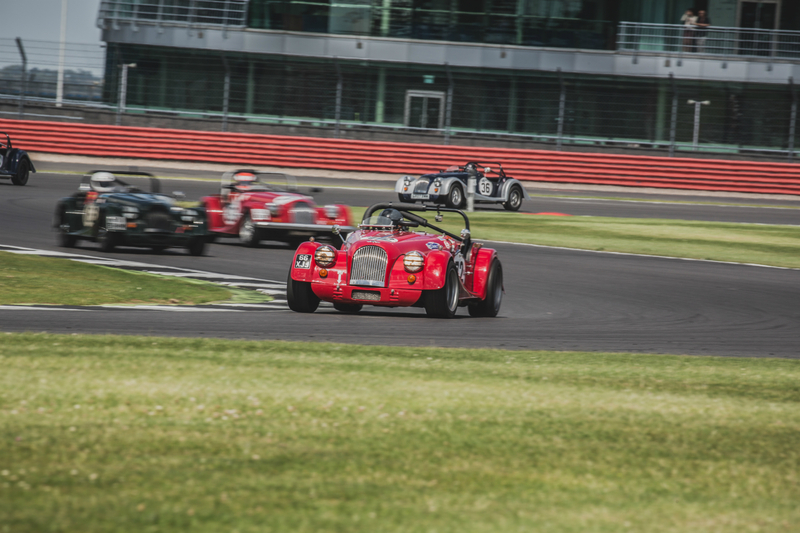 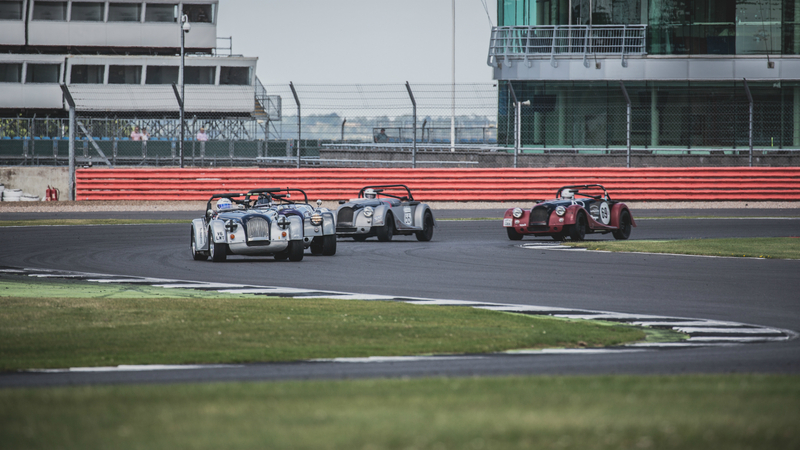 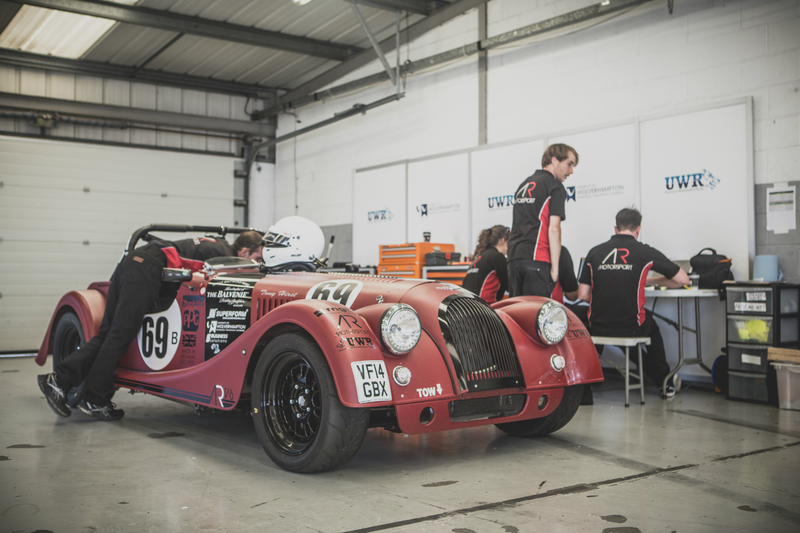 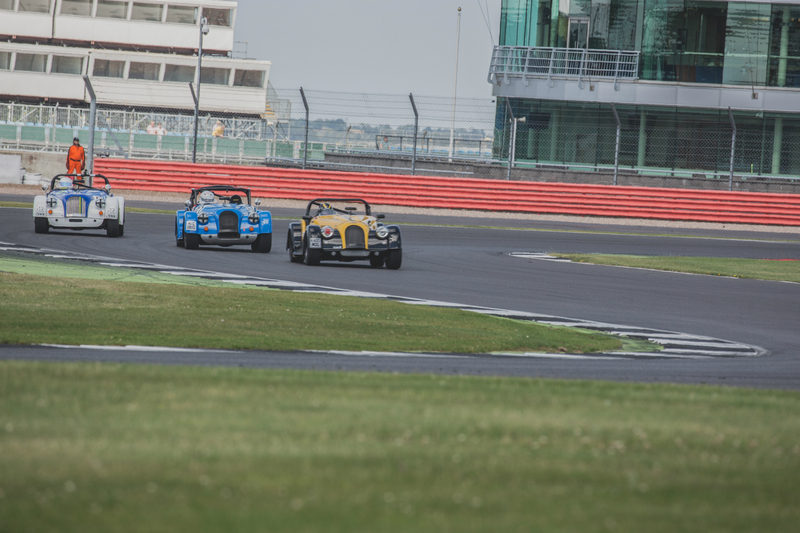 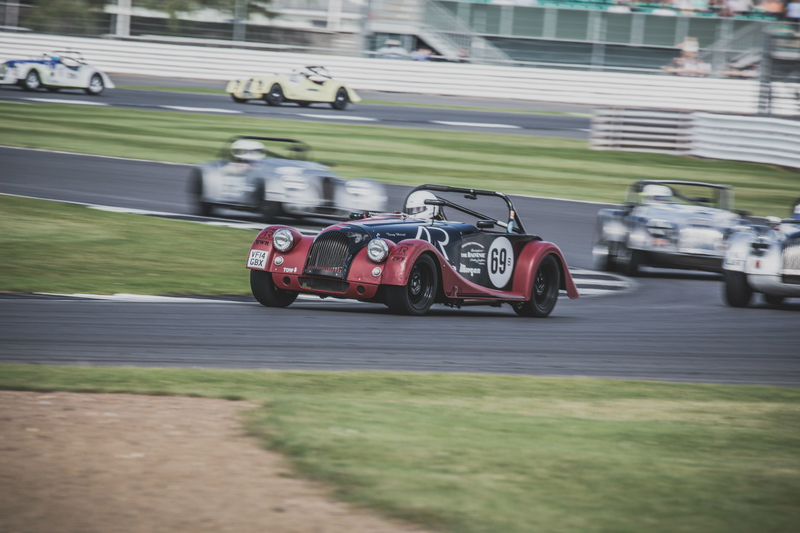 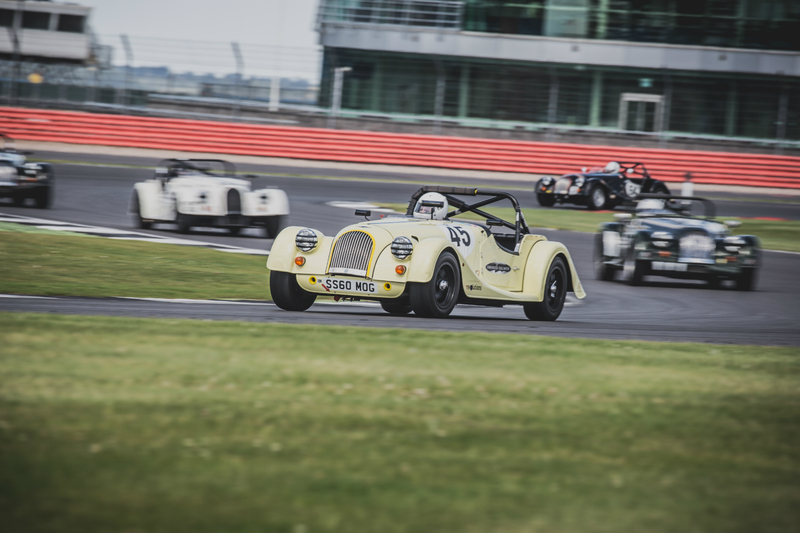 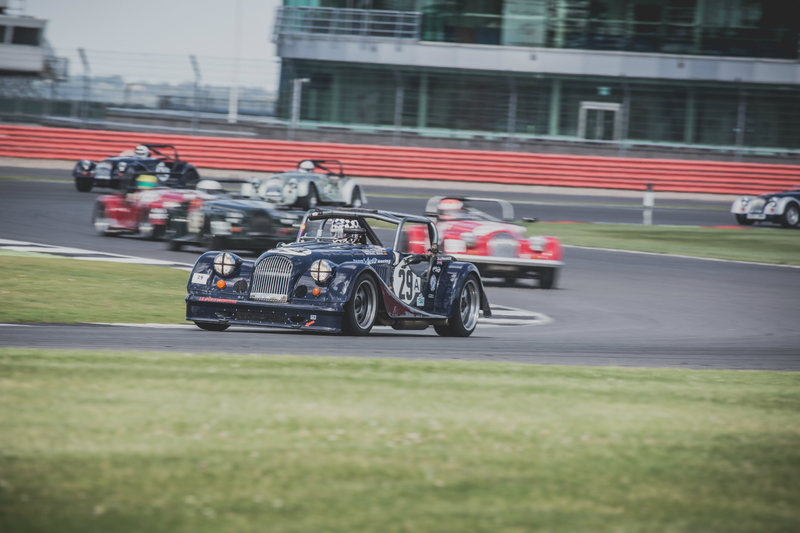 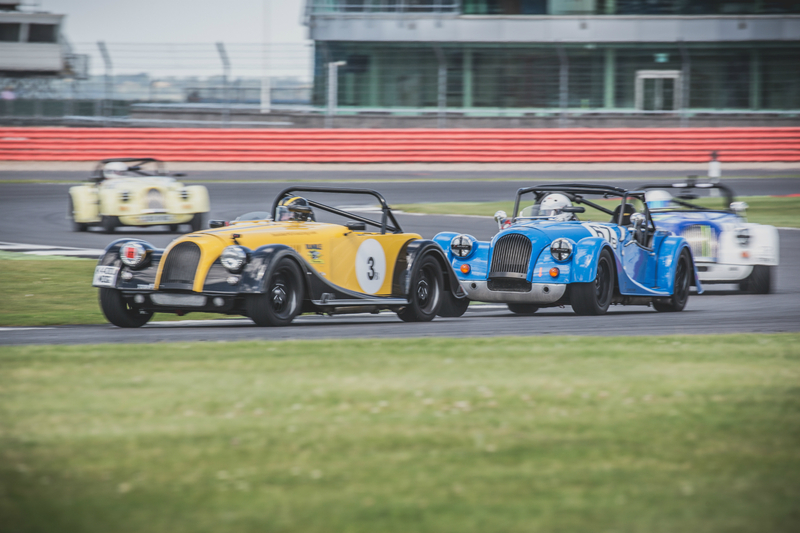 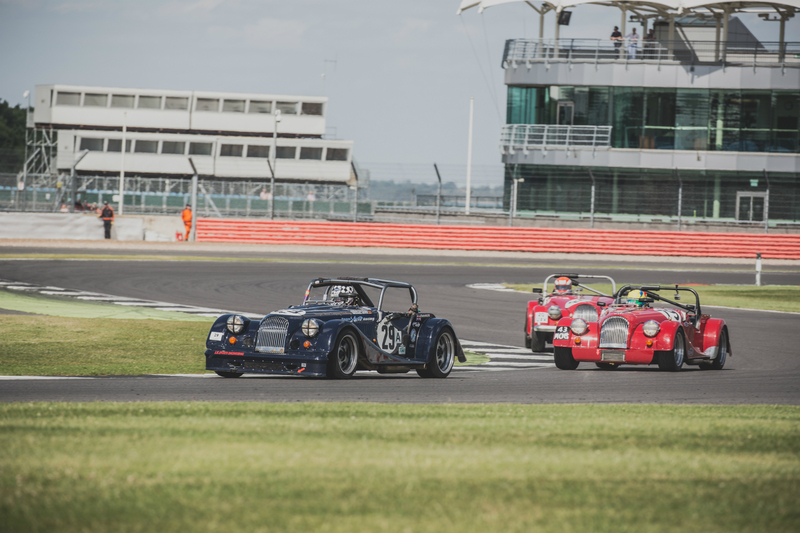 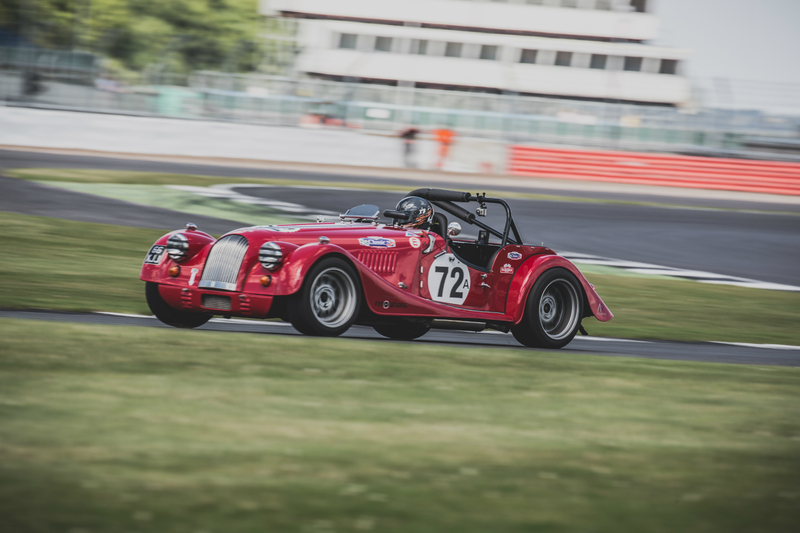 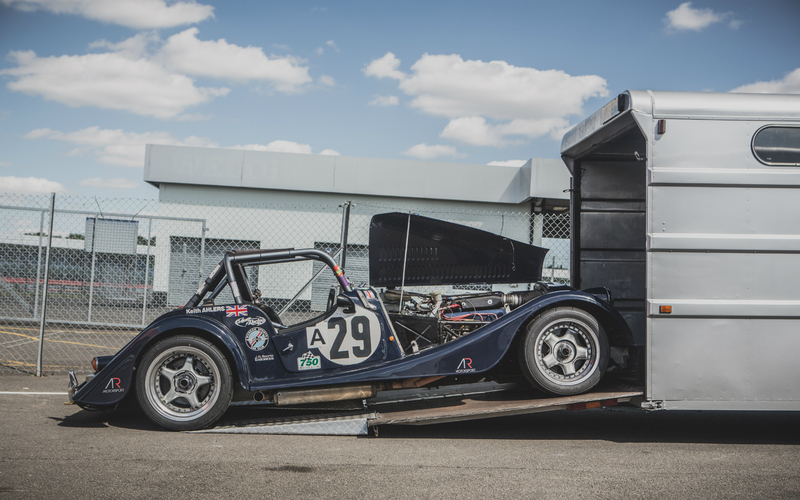 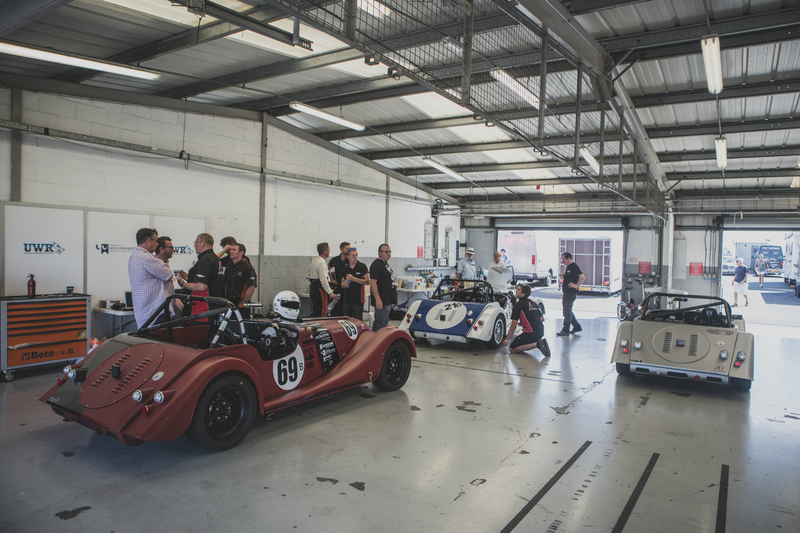 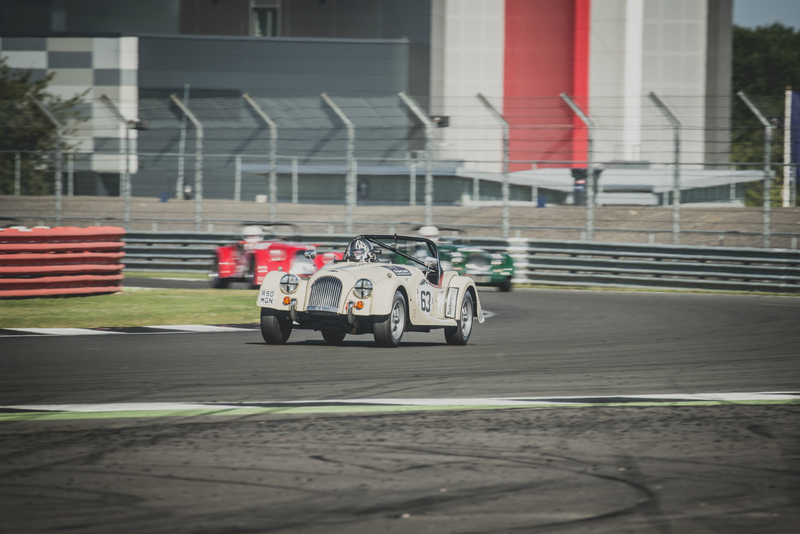 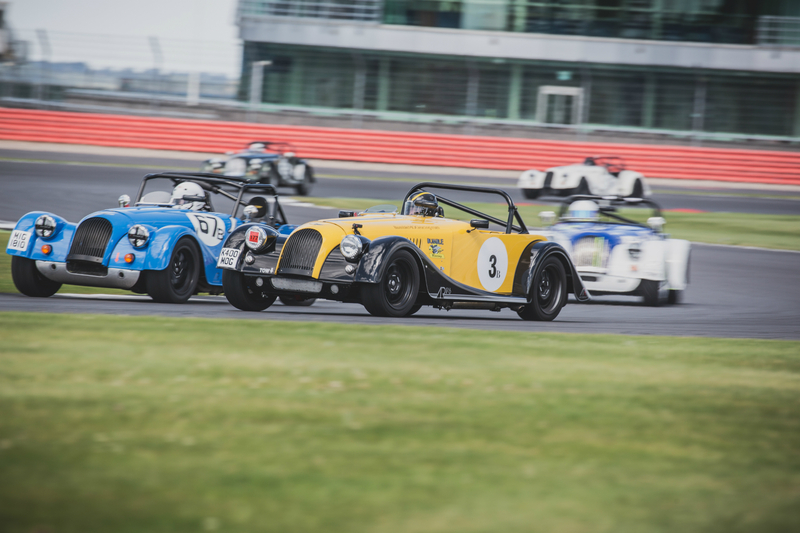 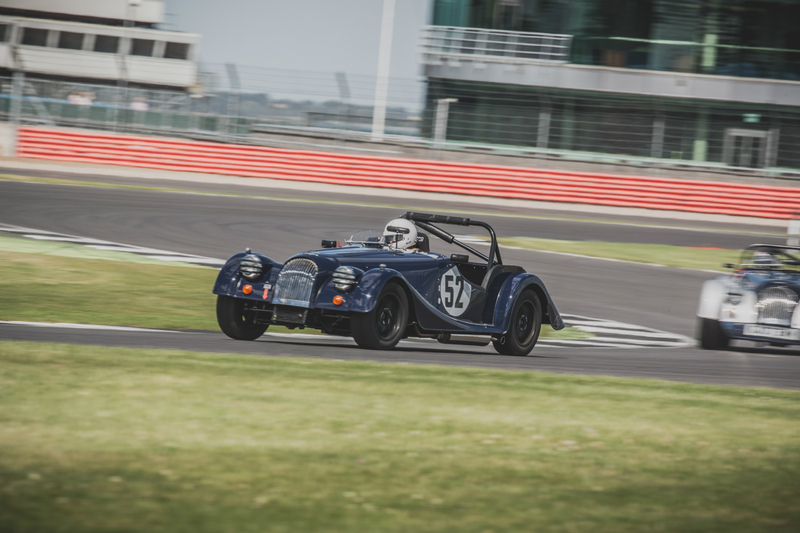 For many years the Morgan Challenge has featured as part of the BDC meeting, and for 2016 the weather had been ordered, with beautiful sunshine engulfing the home of British motorsport. 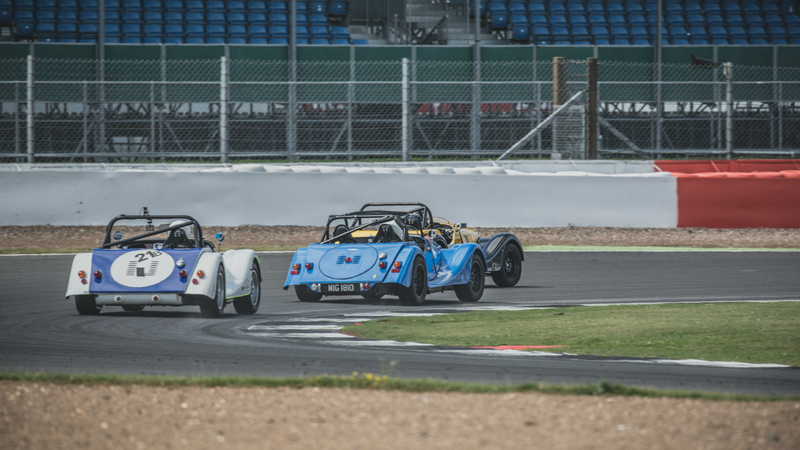 As the cars assembled for qualifying it was a welcomed return to the challenge series for accomplished drivers Olly Bryant and Will Plant in their Plus 8s. 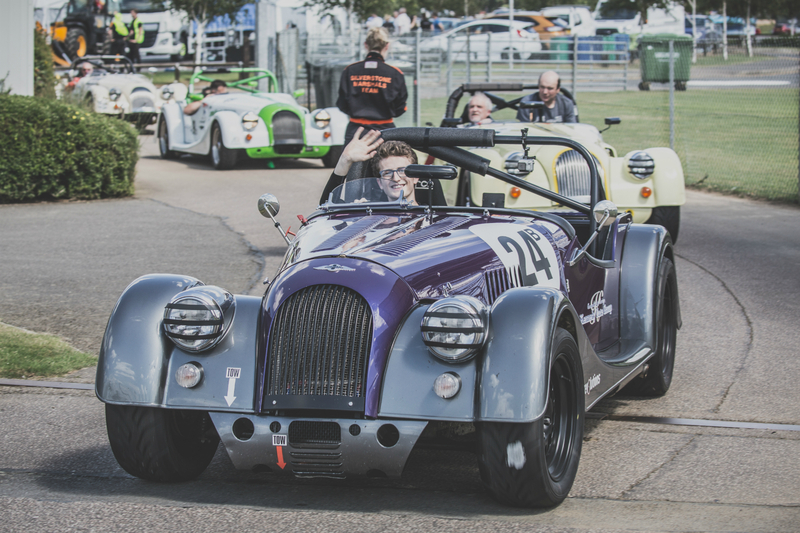 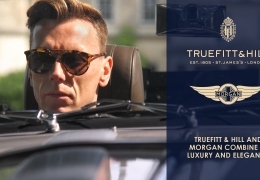 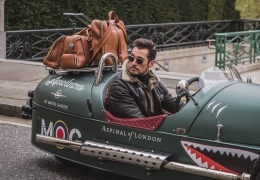 Both of the young drivers do not frequent the Morgan Challenge grid all too often, and are off competing in their respective championships throughout most of the season. 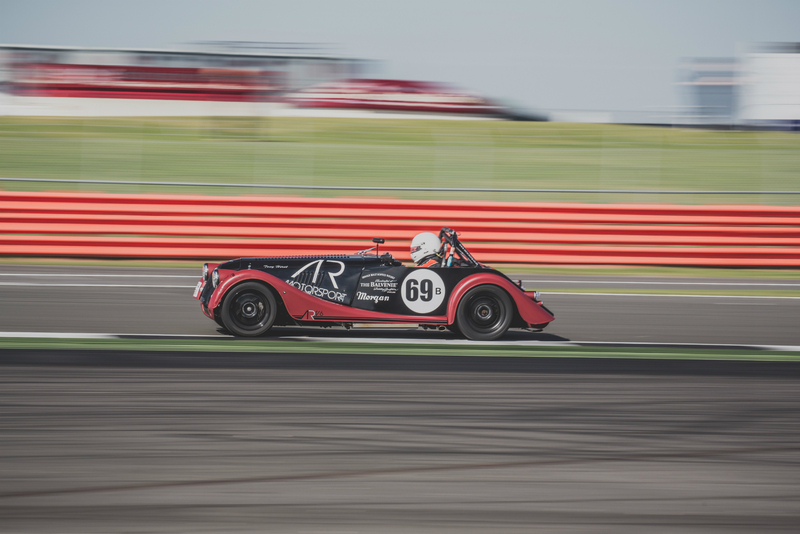 There was also a new name for the grid in Richard Fohl, who was competing for the first time in his Class R Roadster Lightweight. 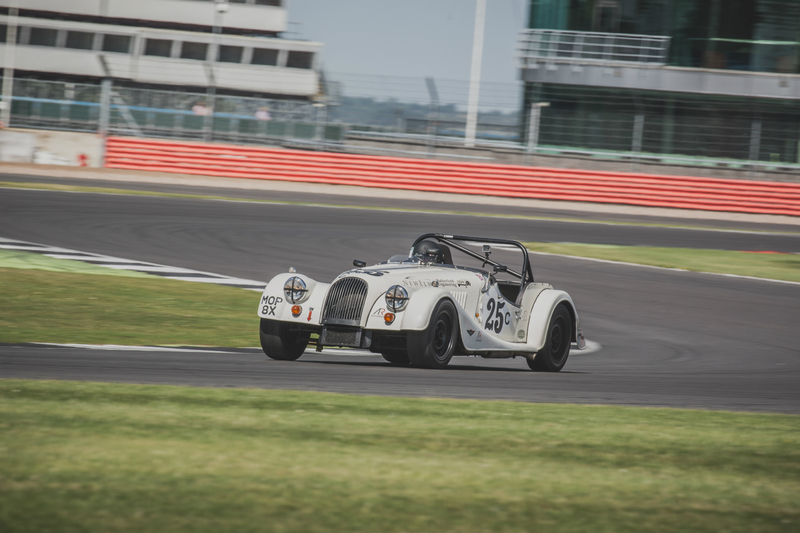 The track conditions were perfect for qualifying, with GT Driver Olly Bryant putting his Plus 8 on pole position, over a second in front of Keith Ahlers. 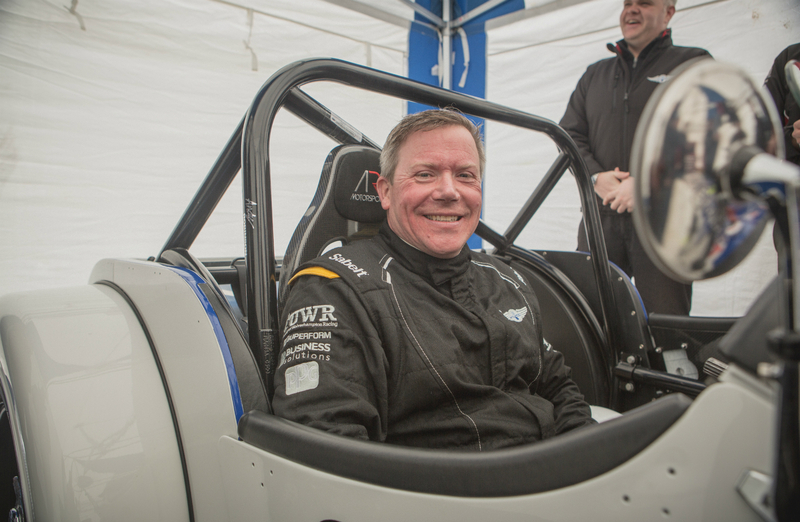 William Plant and Russell Paterson completed the second row of the grid. 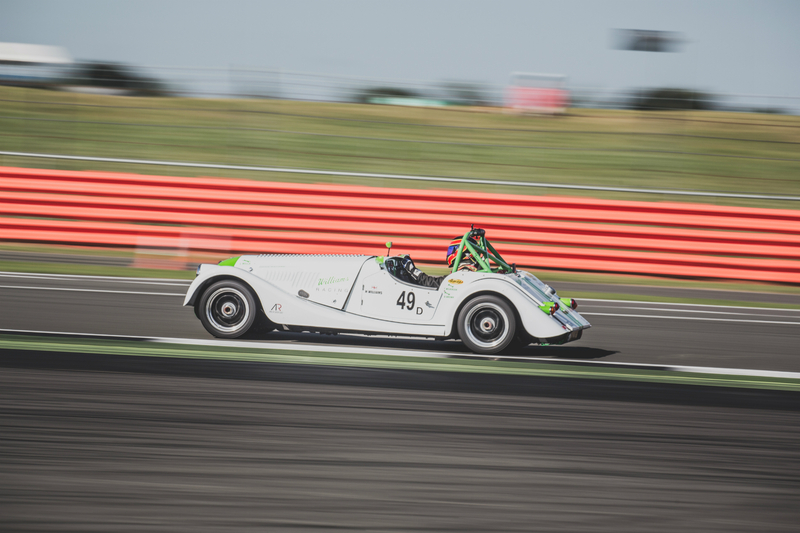 A flying lap from Tony Hirst saw him qualify first in Class B setting a new lap record for the class, just behind him in Class B was overall championship leader Elliot Paterson who left himself with a bit of work to do in the race. 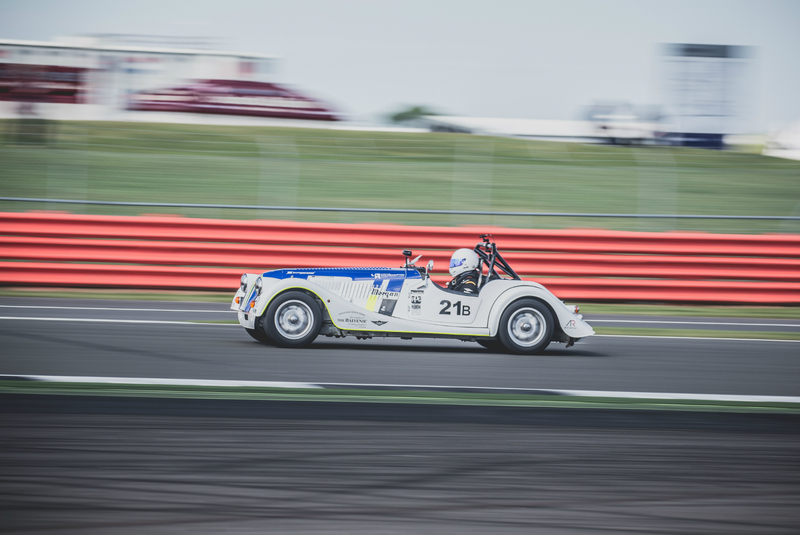 A marked improvement from Craig Hamilton-Smith saw him qualify 5th in Class, significantly higher up the grid than his last outing. 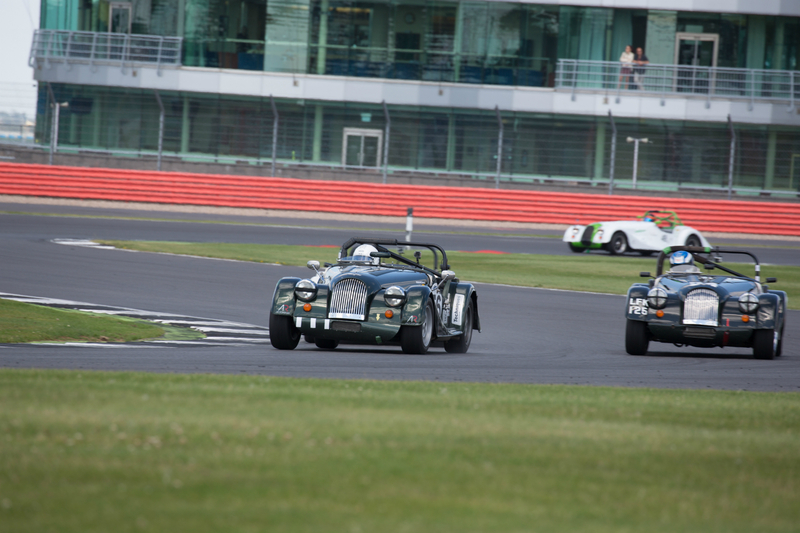 Familiar 1st place qualifiers in Classes R, C and D were Tim parsons, Steve McDonald and Henry Williams. 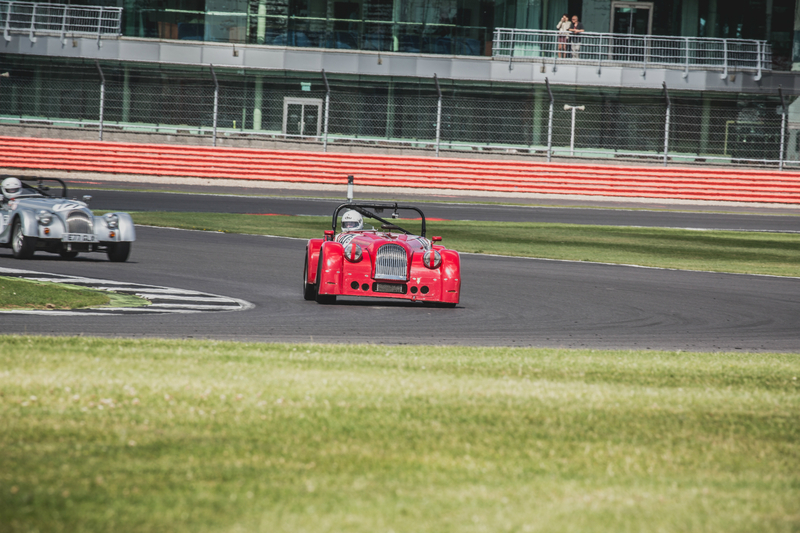 It was just Chris Bailey and Ian Sumner in Class E, with Bailey qualifying ahead of Sumner by just over a second. 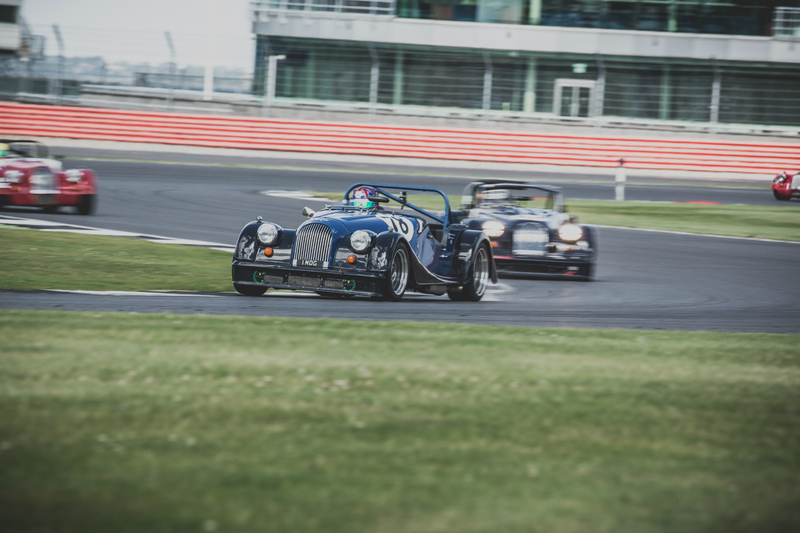 After a few flying laps of the track from the Bentley GT3 car, it was over to the Morgan Challenge race, and what another fantastic race it was. 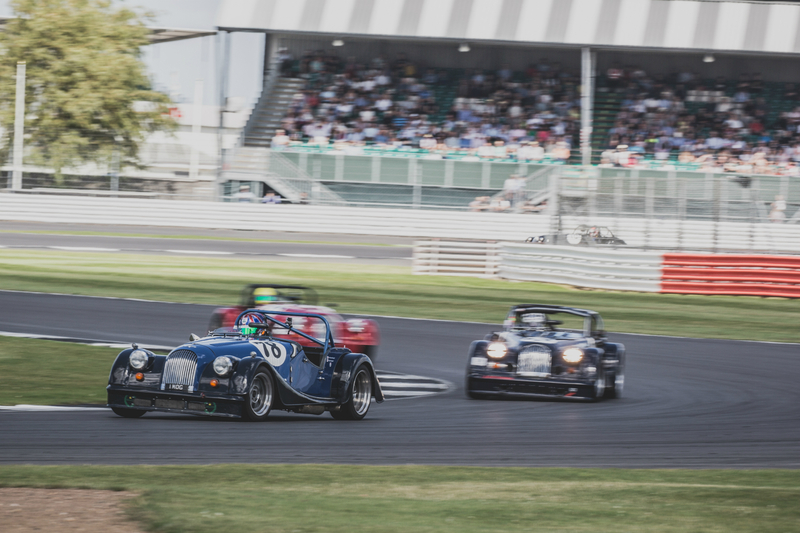 Finding himself in the unusual position of second place on the grid, Keith Ahlers immediately took the lead from Olly Bryant as they diced with each other during the first lap. 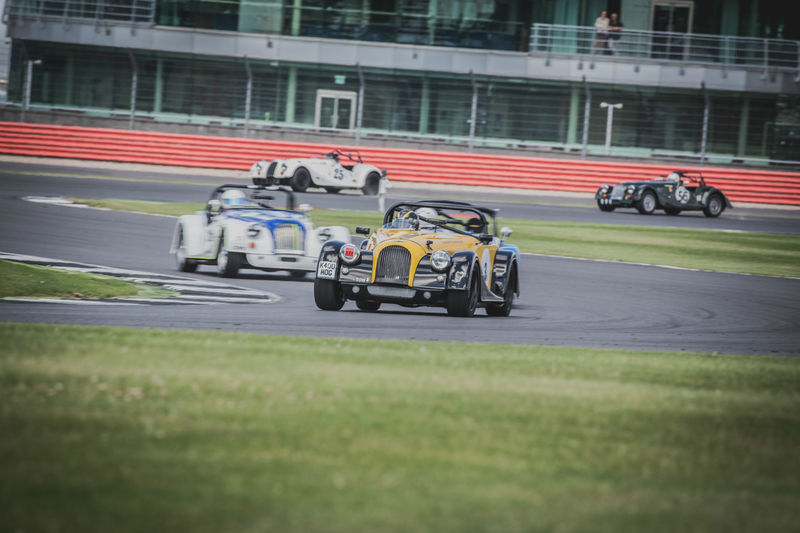 Regaining the lead, some great racing from Bryant saw him edge out in front and stretch his legs to a significant win overall and fastest lap of the race. 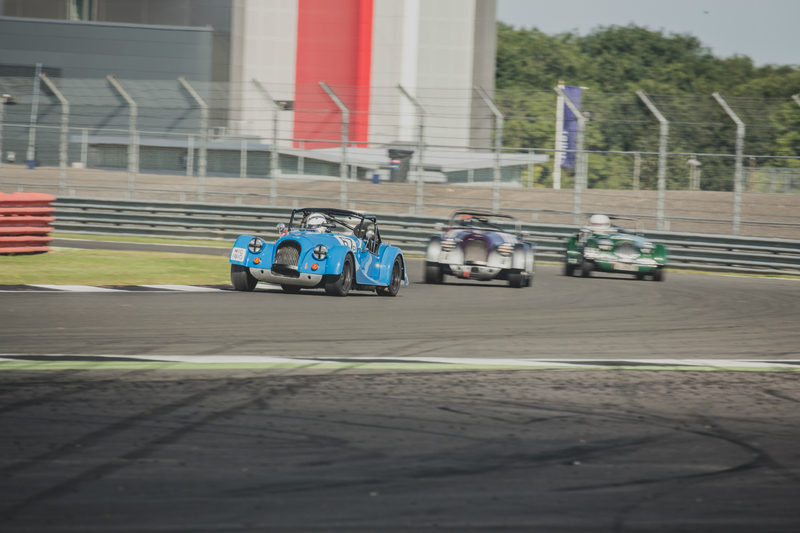 Second place was left to Keith and the young Will Plant to battle out, some close racing throughout the session saw them exchange positions on multiple occasions, with Ahlers eventually finishing under 1 second in front of Plant. 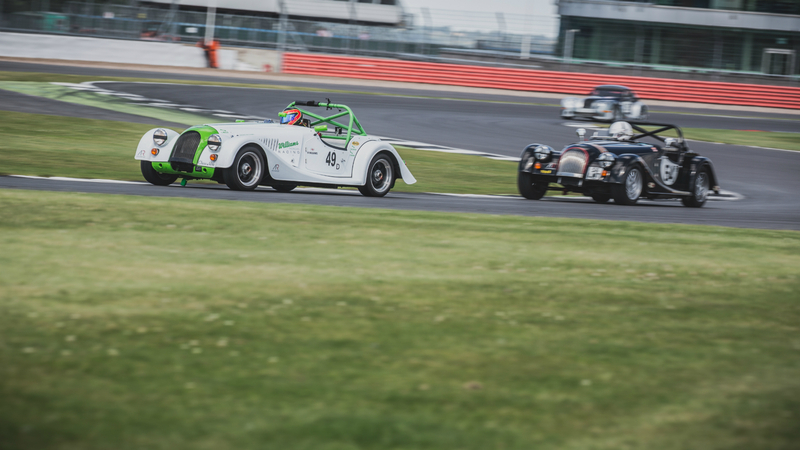 Wheel to wheel racing between the both saw Ahlers take driver of the day, with many spectators commenting how it was nice to see a little competition at the top of the grid for a change. 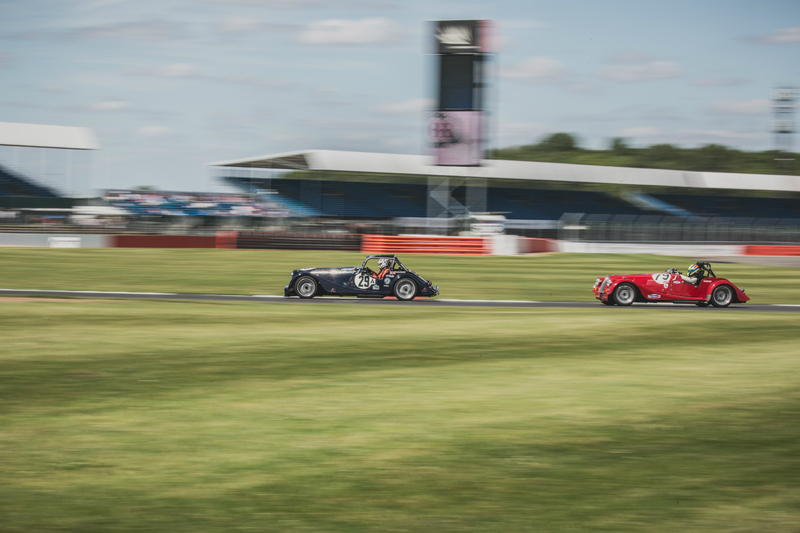 The battle for Class B was very hotly contested; Tony Hirst gave up the lead to John Emberson early on. 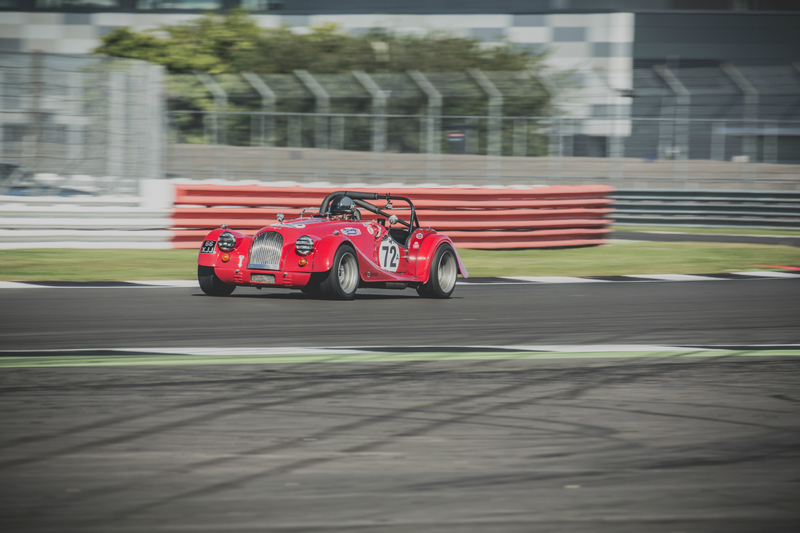 An unfortunate issue for John Emberson saw him retire as Elliot Paterson stormed through to take maximum points and overall Class B winner to stay top of the championship. 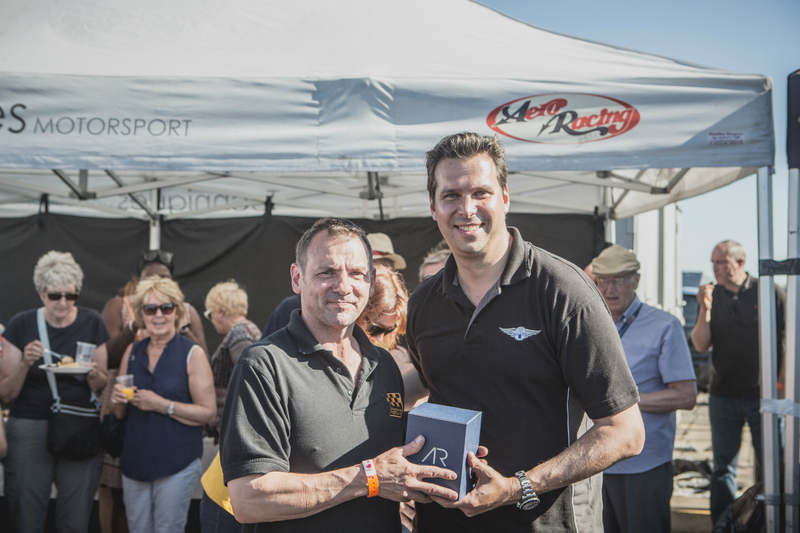 Having qualified strongly Tony Hirst was disappointed to finish 3rd place in Class B behind Andrew Thompson. 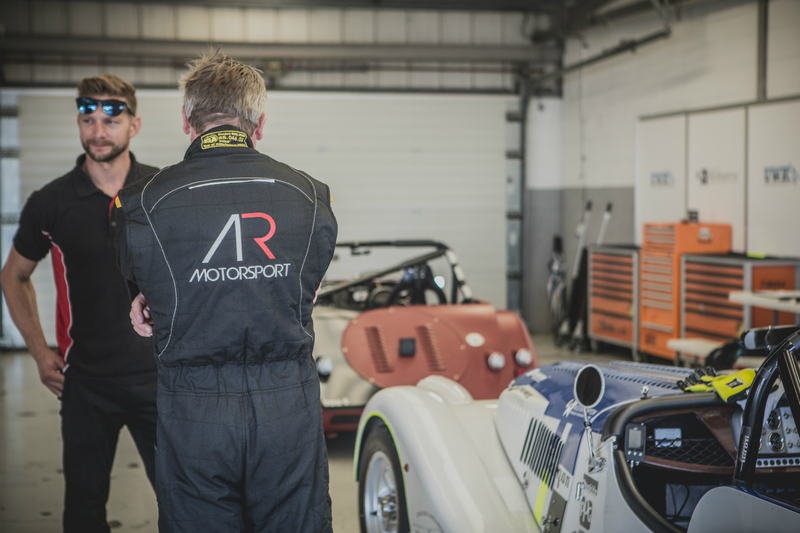 Both Hirst and Thompson have had their ARV6s side by side on more than one occasion this season, a rivalry that seems to repeat itself time and time again. 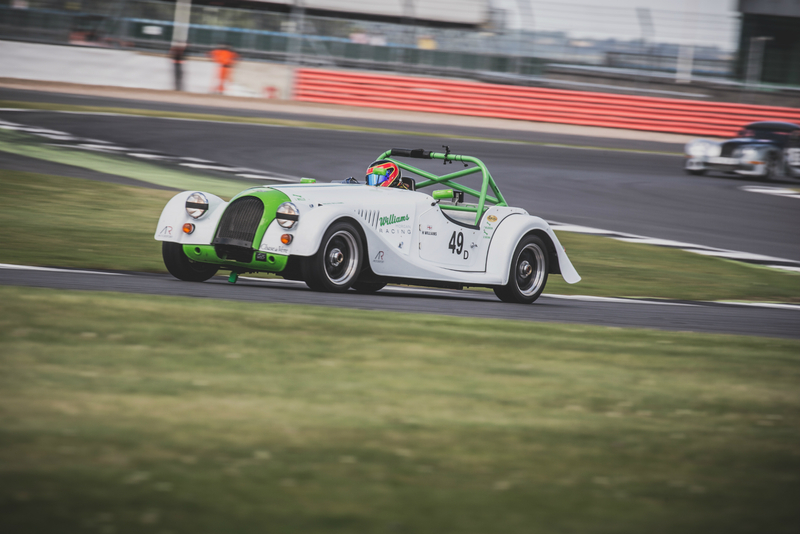 An unfortunate spin for Craig Hamilton-Smith saw him finish 6th position in Class B behind Stuart Anderson and Dominic House, despite the spin his overall finish is a vast improvement on previous races. 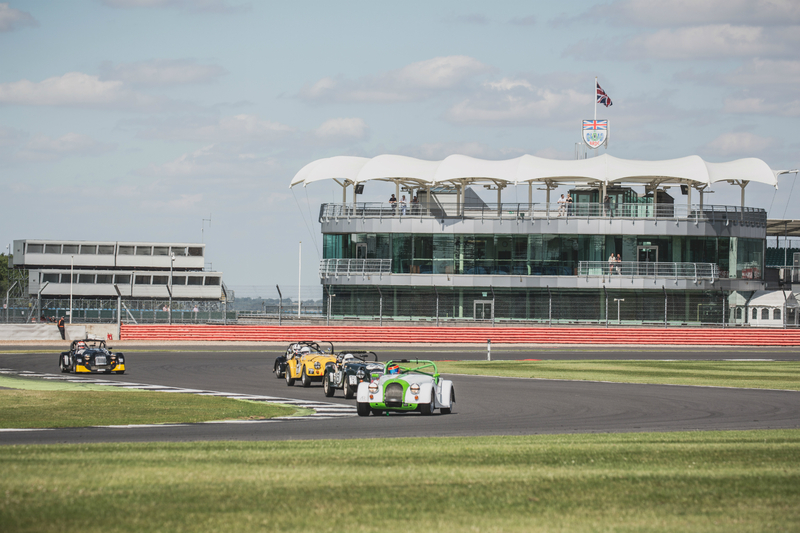 Tim Parsons, Steve McDonald and Henry Williams managed to retain their qualifying positions to each win their respective classes. 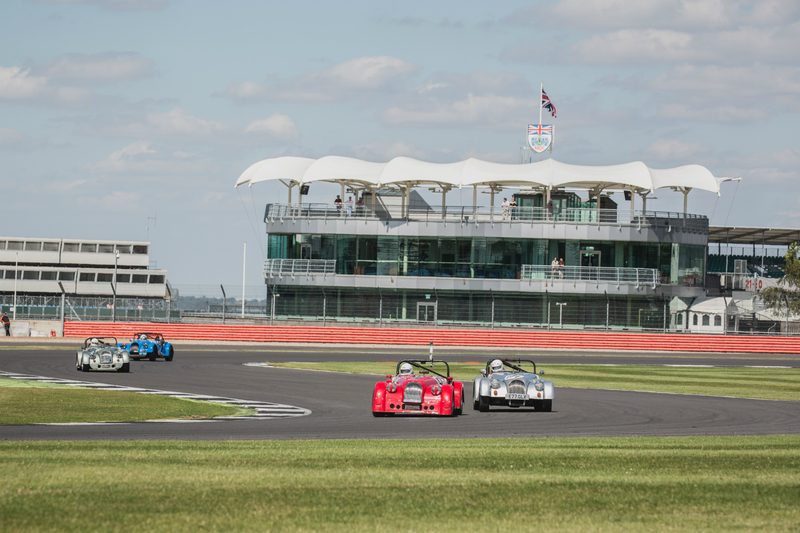 Brett Syndercome, Simon Scott and Tim Ayres each managing to retain their second place positions in respective classes. 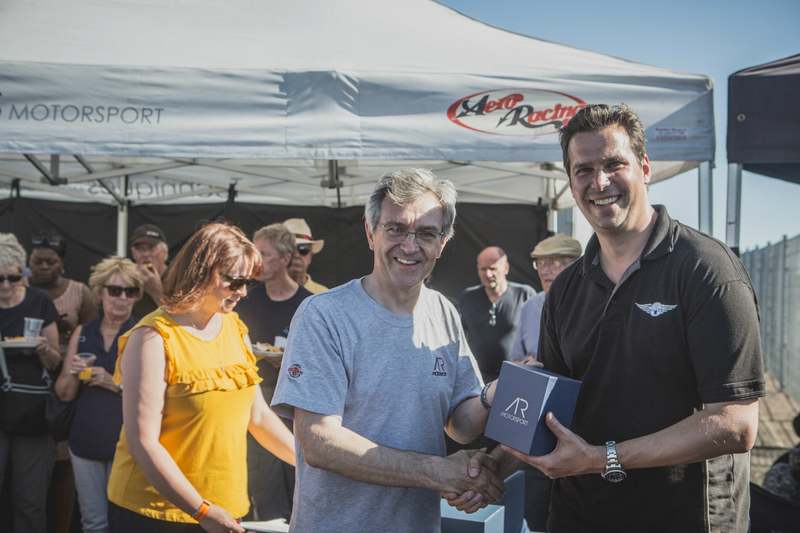 The Techniques Trophy race for 4 cylinder Morgans followed the challenge race, congratulations to Henry Williams for an overall win in that. 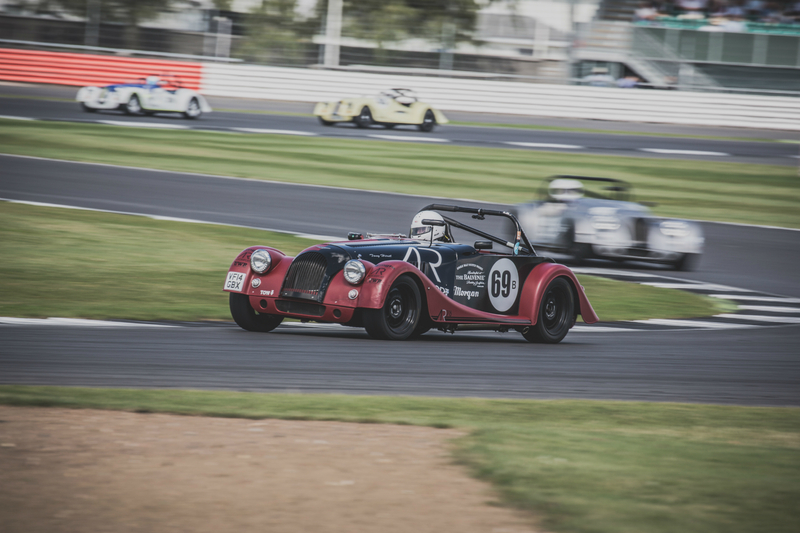 Next up, Oulton Park on the 3rd of September. 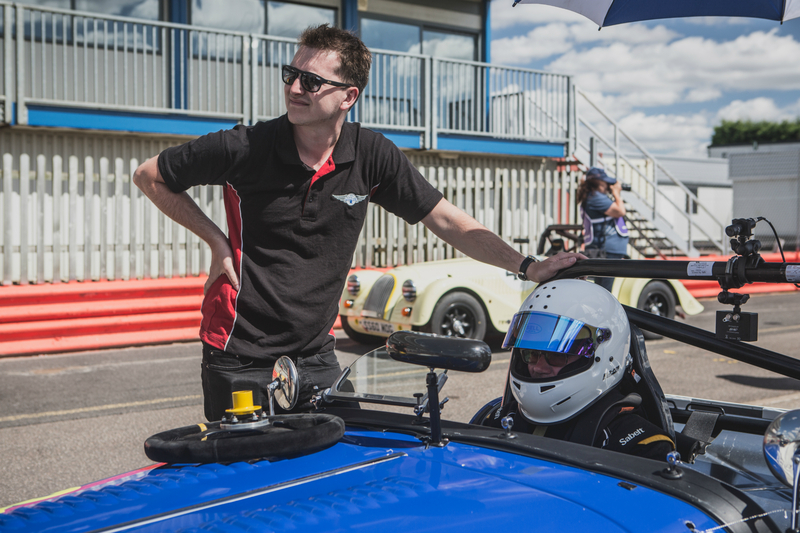 Bio: Competing this year in his first season of motorsport, Craig is fourth generation of the Morgan family and a shareholder of the company. 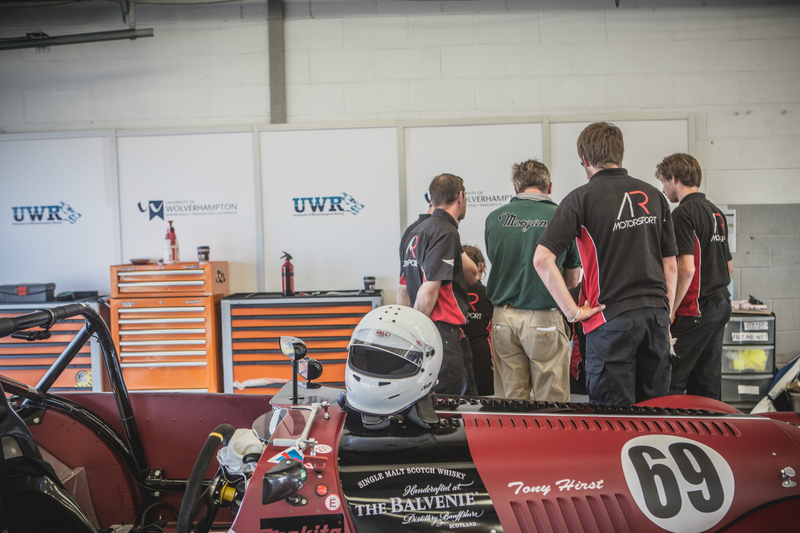 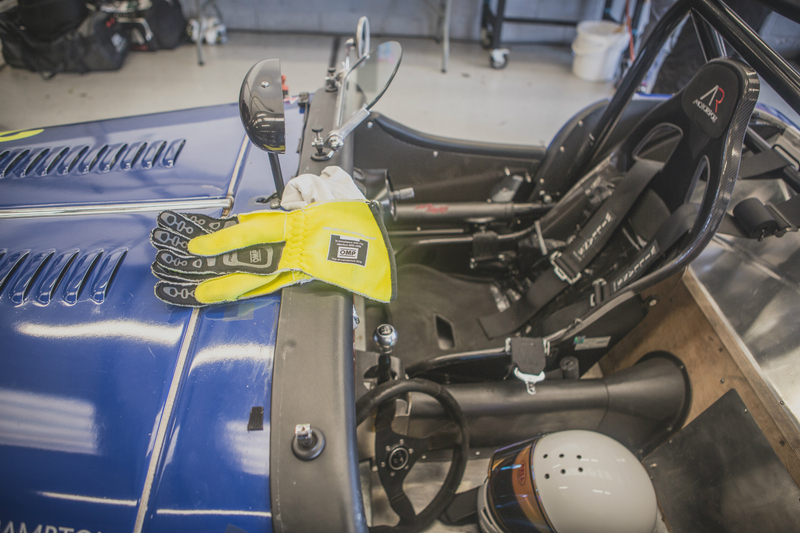 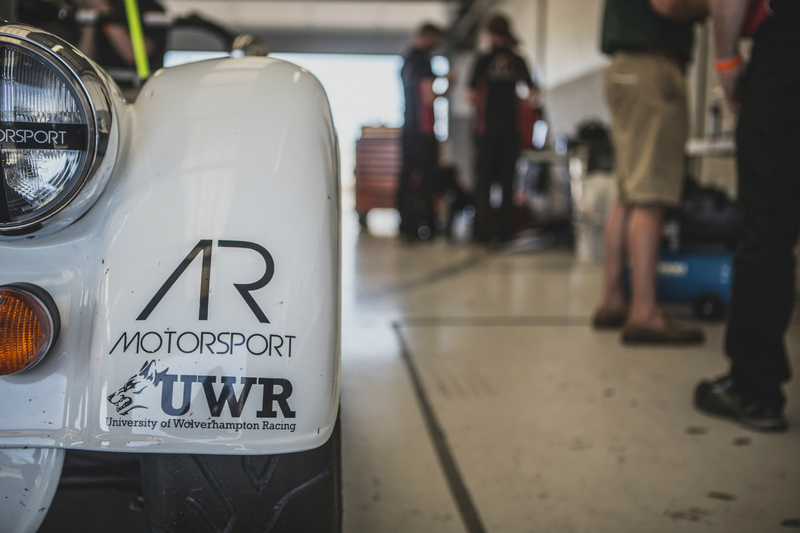 Racing in the University of Wolverhampton prepared Plus 4 Babydoll, he is being taught by expert racing driver Shane Kelly and takes guidance and support from the UWRacing student team who look after the car between races and prepare it on race days. 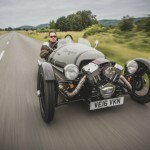 Craig drives a 3.0 litre V6 Roadster Morgan as his daily driver and has been in and around Morgans since he can remember. 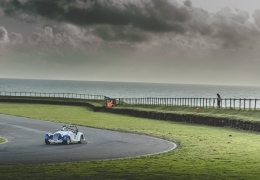 A break since Silverstone and an absent meeting for coverage at Angelsey. 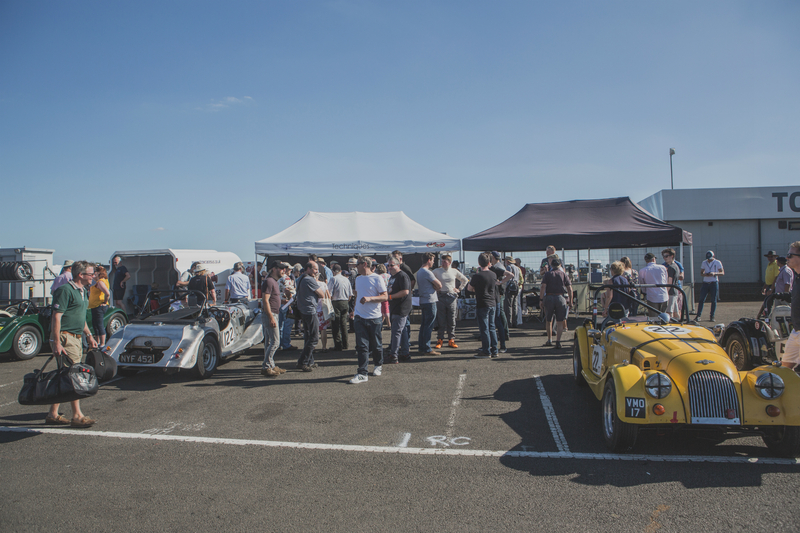 How did the Angelsey weekend go for you? 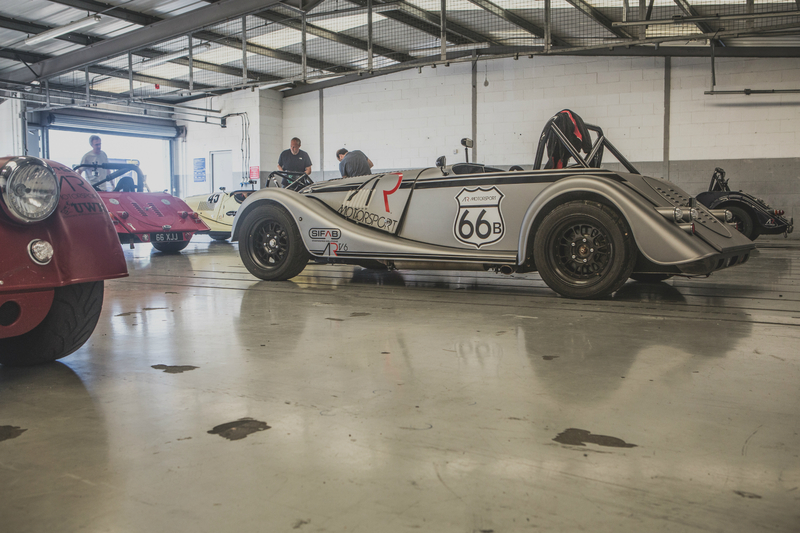 Anglesey was where it came together for me, the track is a joy! 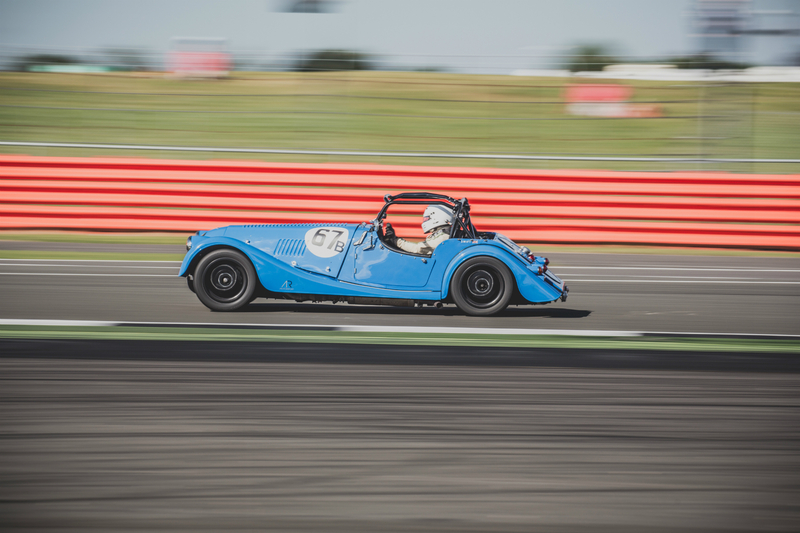 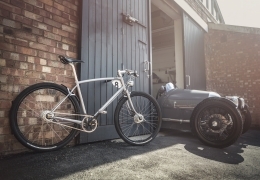 Undulating, fast corners, tight corners, and a lot to think about and do, great for me and the Baby Doll and certainly a meeting where I felt I’d reached another level. 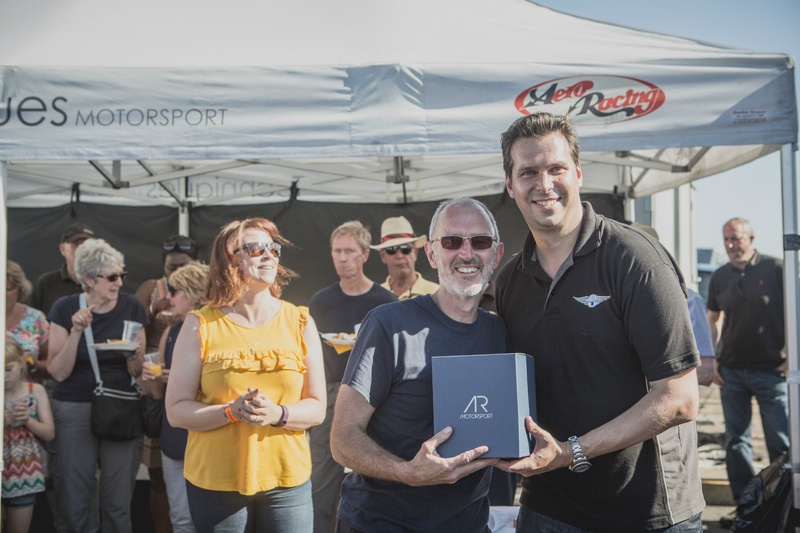 I was delighted to recieve Driver of the Day. 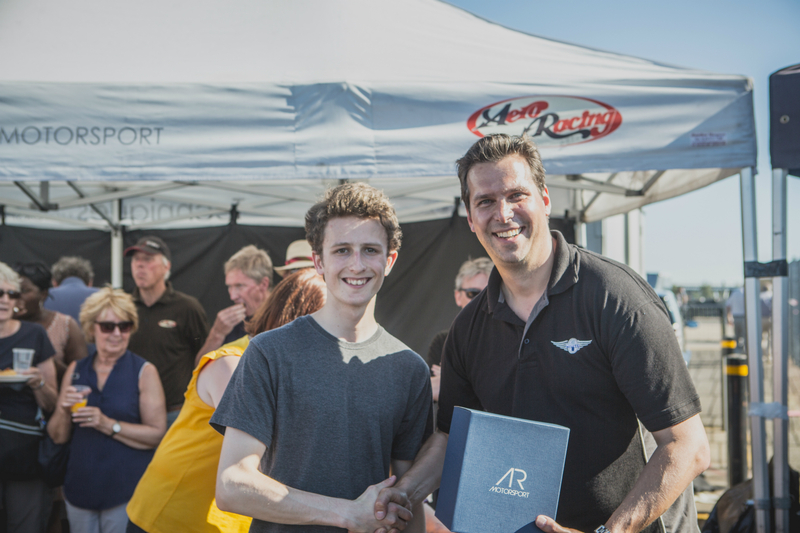 Driver of the day and strong finishes at Angelsey, can you feel it all starting to come together? 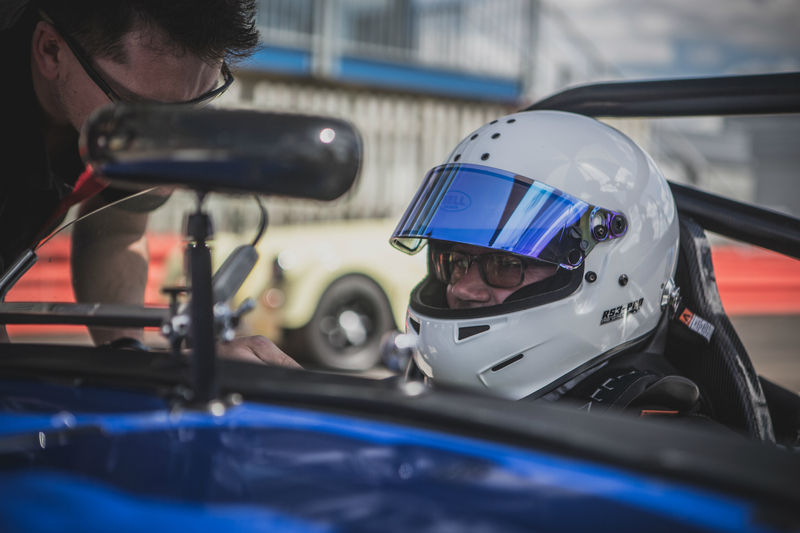 Definitely, it has taken a few races to feel what is possible but now it is starting to feel normal to be doing these speeds and braking so hard, I know there is much more to perfect in me and that I can go much, much faster, but that’s all in good time. 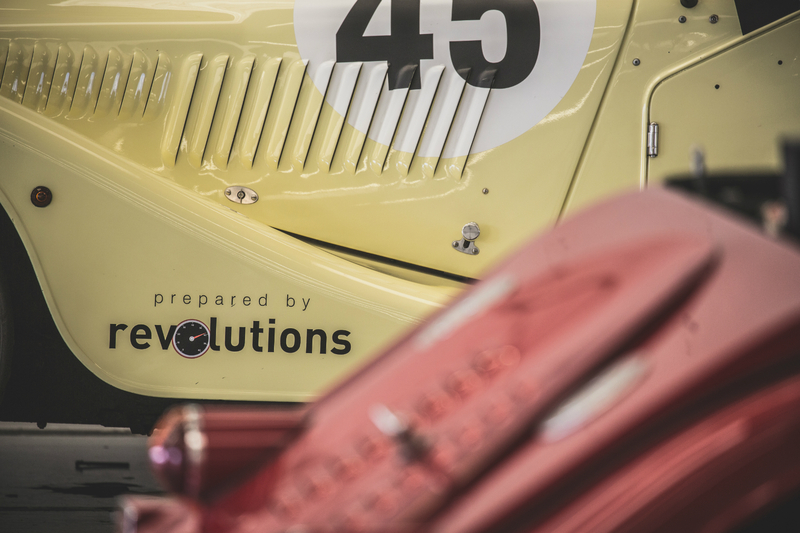 What do you put your improvements down to? 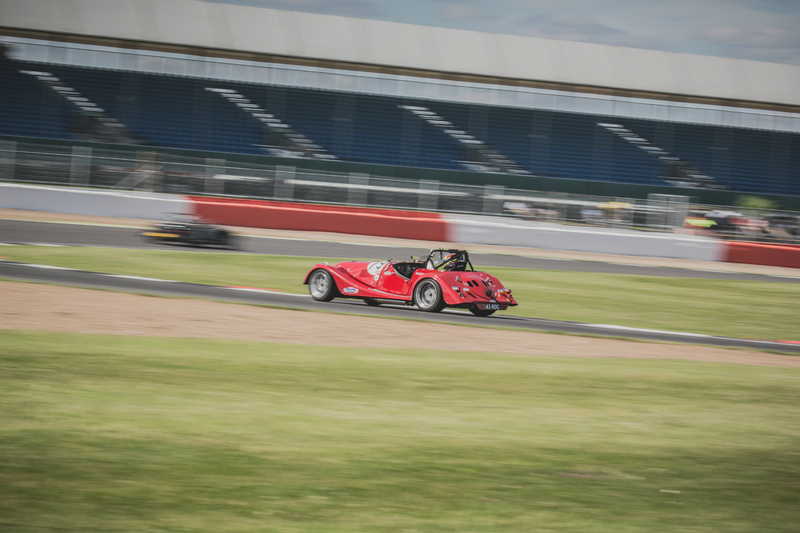 A great qualifying session at Silverstone today, are you enjoying the national circuit over the GP circuit more? 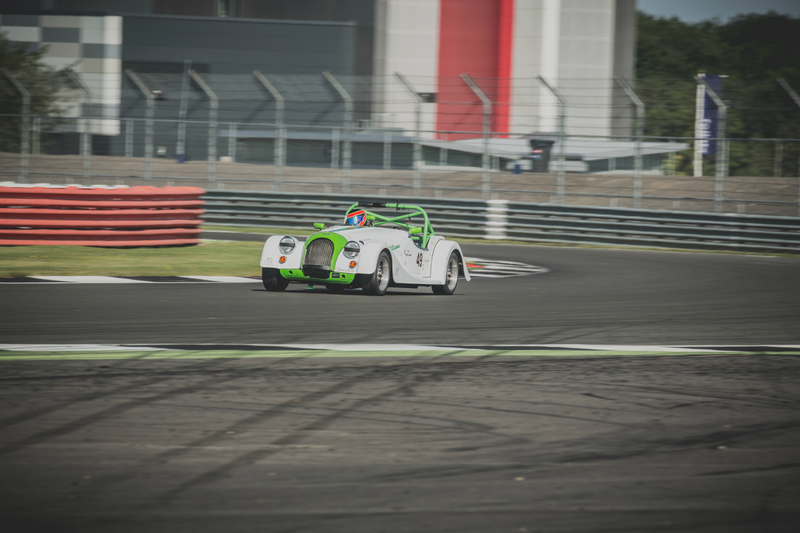 Qualy was very good I improved on my expected lap time by 3 seconds. 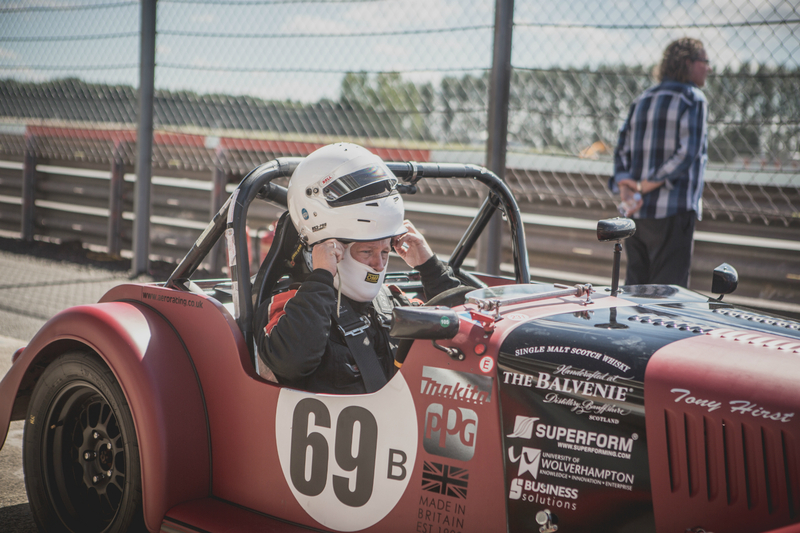 GP and National are great, I don’t prefer one to the other but having raced on the National more times I feel more comfortable on it. 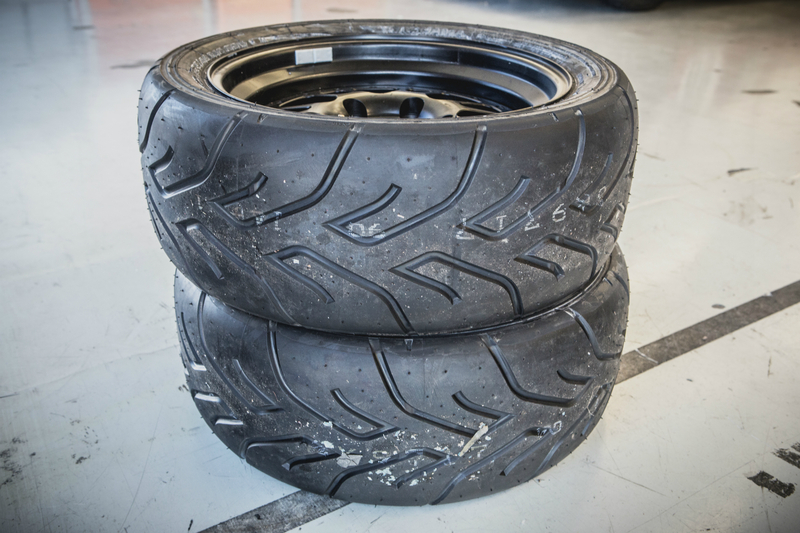 You’re much higher up the leader board this half of the season. 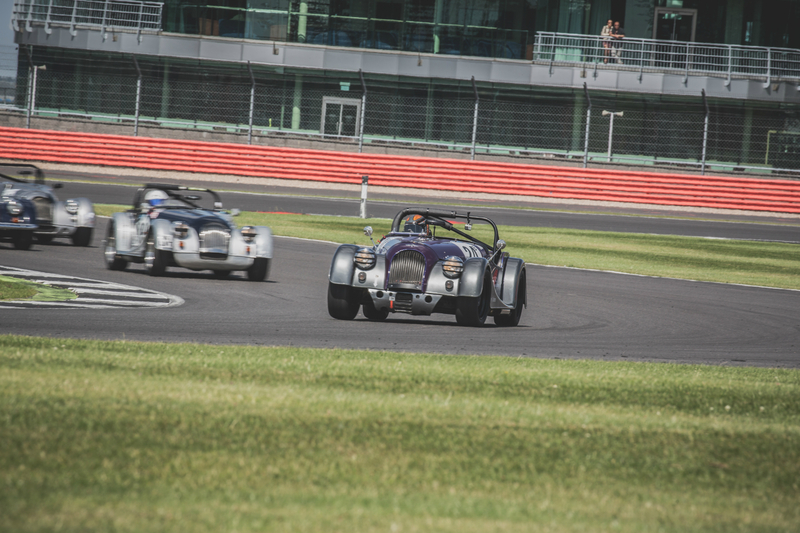 Talk us through your race? 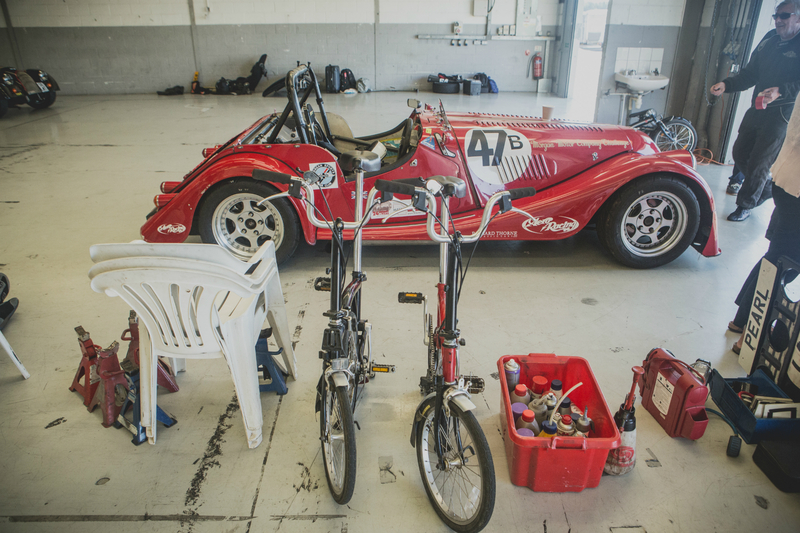 Great qualy. 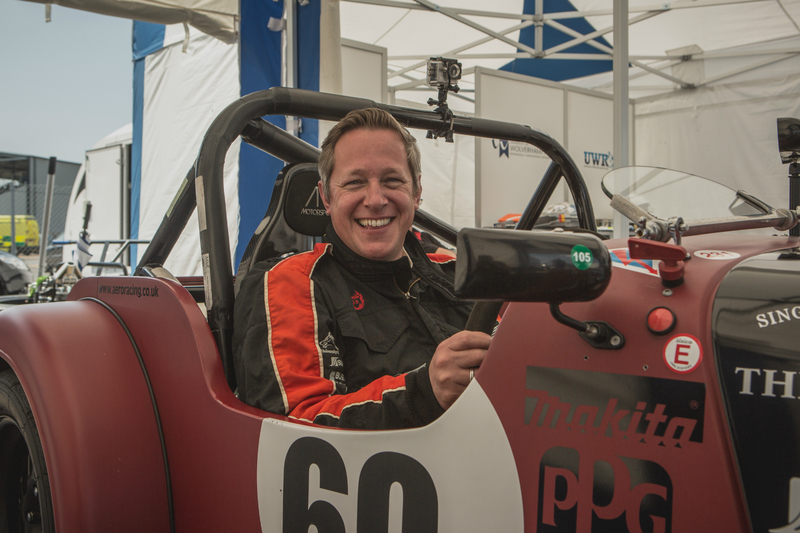 Surprised and delighted to be so high up on grid position at the start. 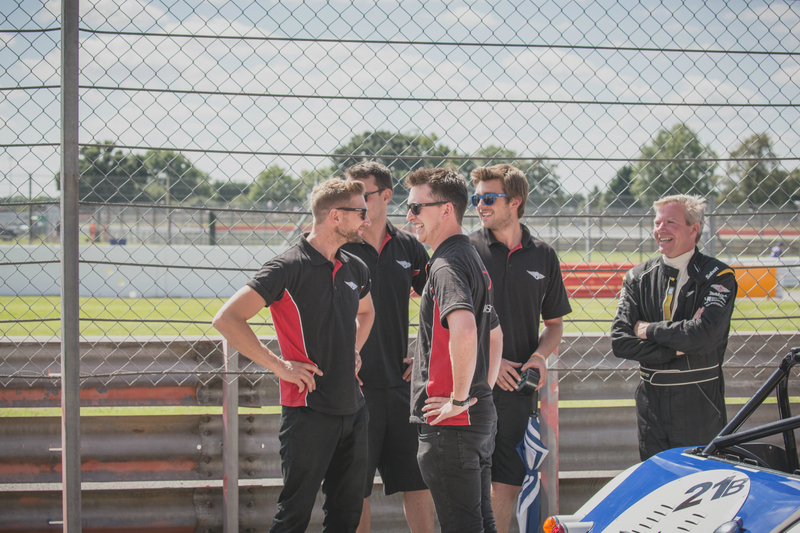 Had a good start and kept the pressure on. 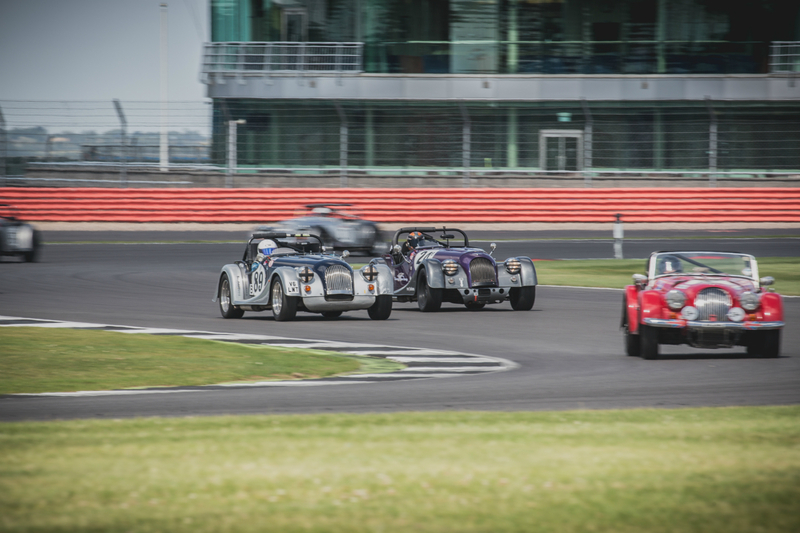 After a few laps it was a battle between myself, Dominic House and Stuart Anderson. 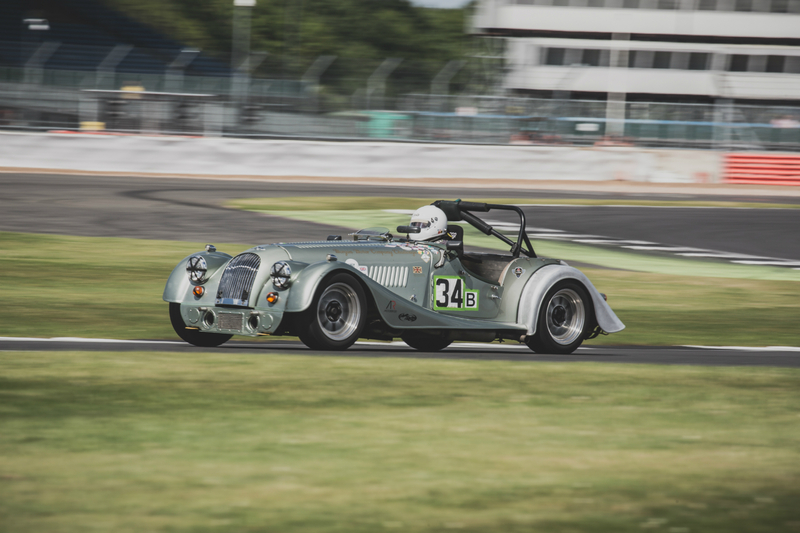 I passed Dominic and then was trying to pass Stuart on the inside at Maggots and nearly had a ding dong which put me into the grass, luckily managed to avoid the wall somehow and got back quickly and carried on with the race .I clawed back some places to finish 6th in class and 13th out of 31 my best race so far. 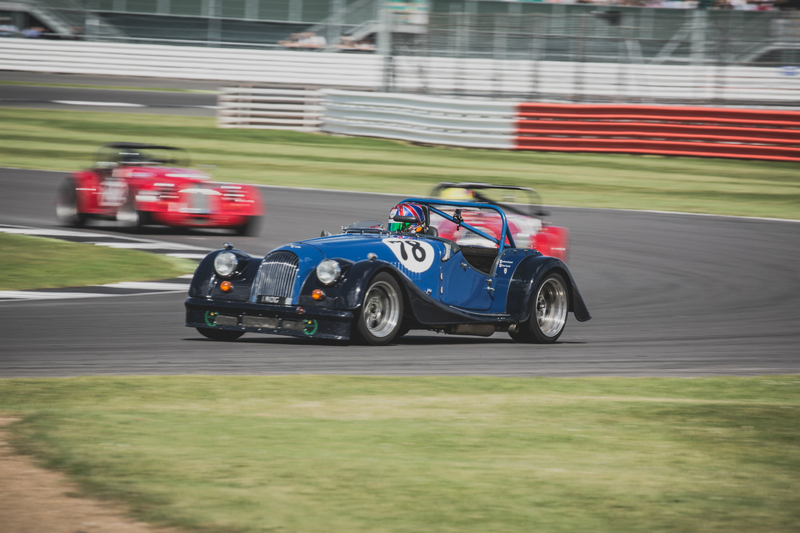 Very much looking forward to Oulton. 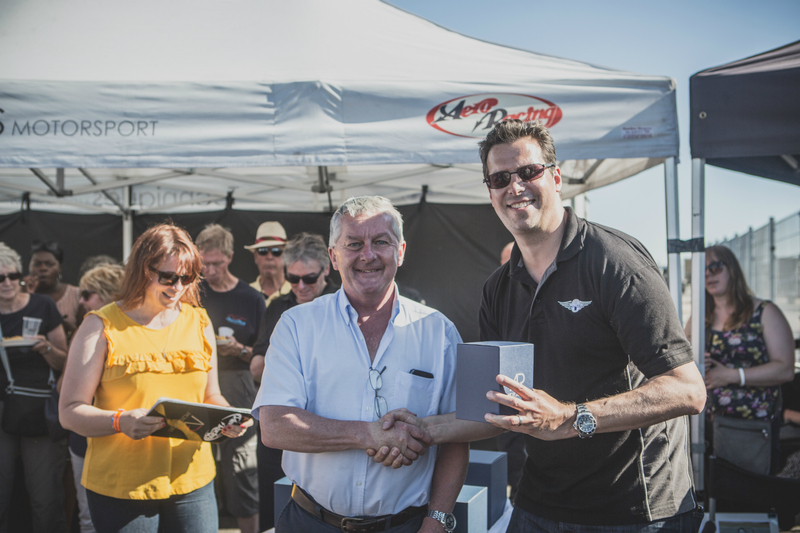 A Summer break and a trip to Angelsey, how was that meeting for you? 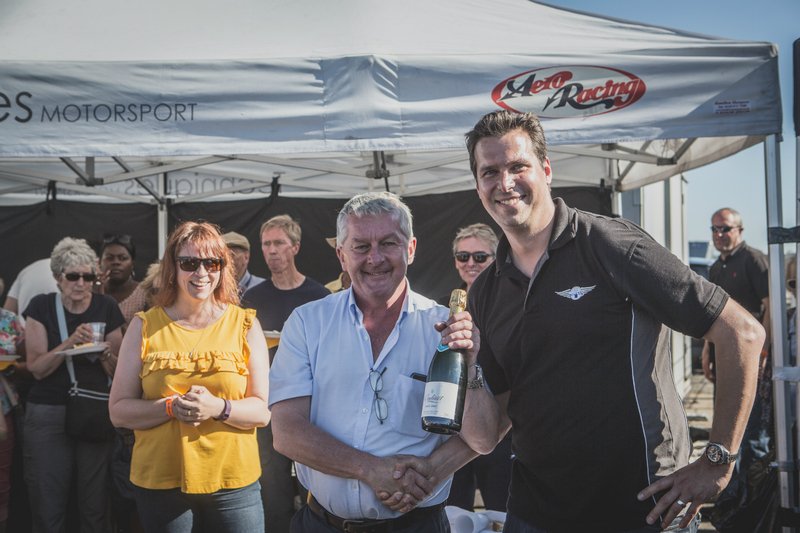 Angelsey was fantastic. 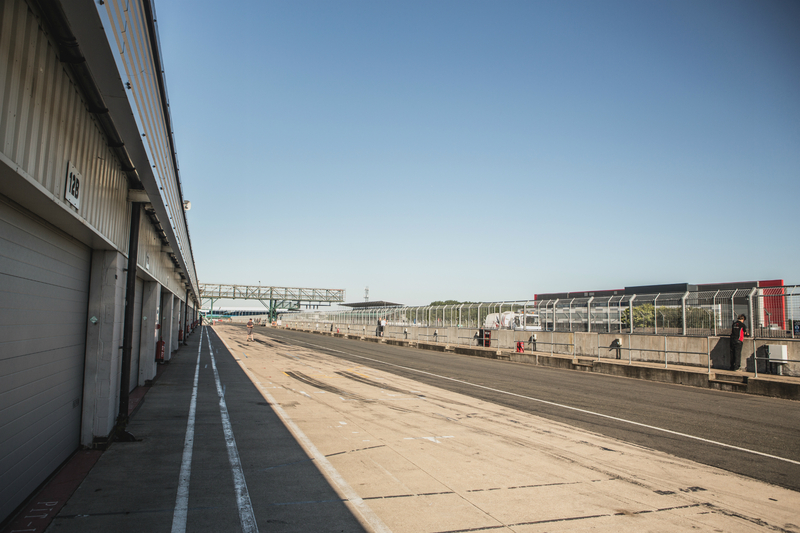 It’s such a beautiful circuit in a stunning part of the world. 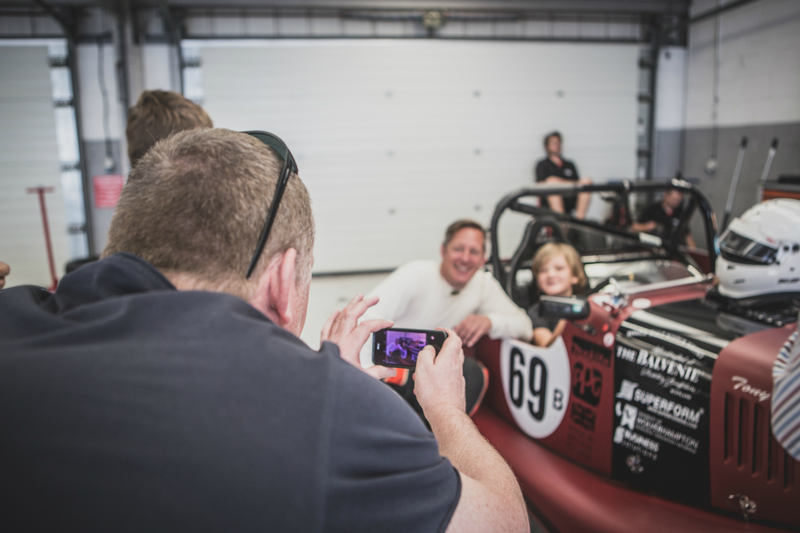 There is one section where you are about to go into a corkscrew and come face to face with Snowdonia, you have to remind yourself to concentrate on the racing and not get too distracted. 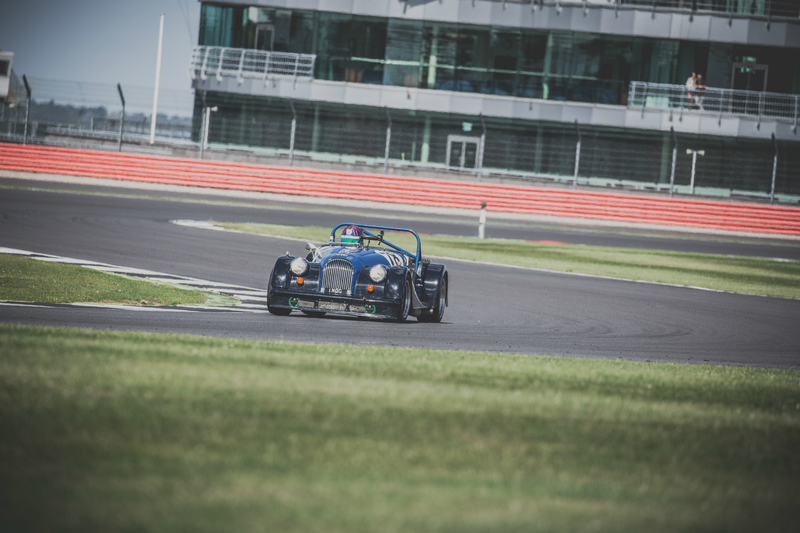 The circuit itself is very tight and technical, you have to be precise and clean throughout and it’s not massively suited to the ARV6. 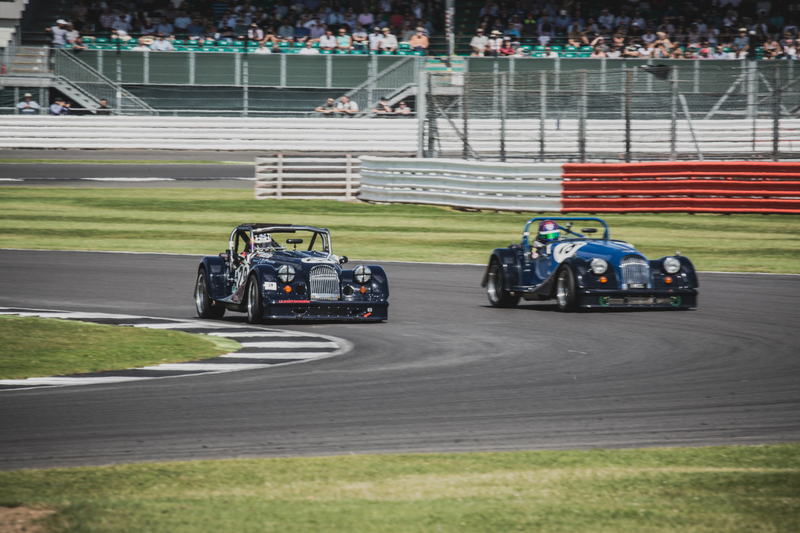 I had yet another great battle with Andrew Thompson and managed to hold him off until the end of the race. 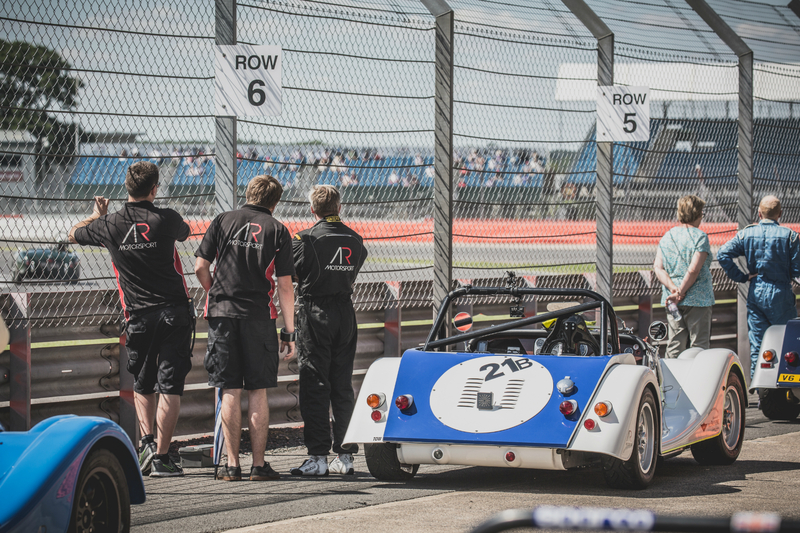 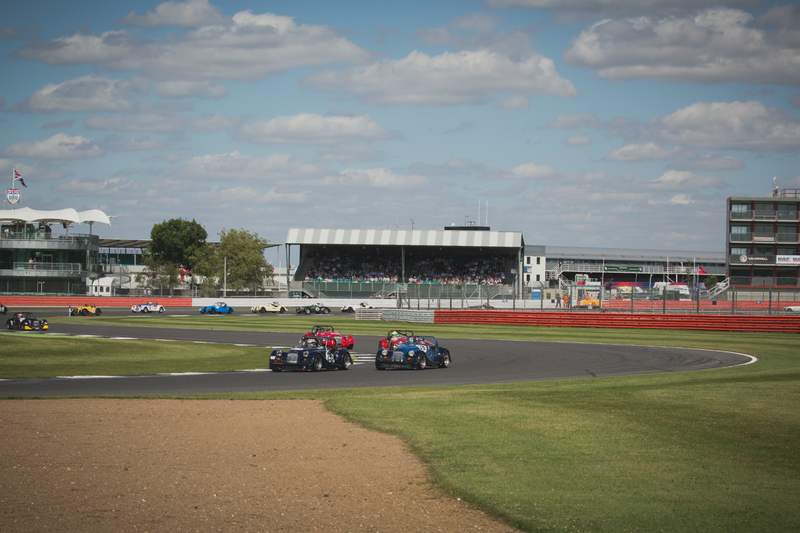 Our 3rd and final visit to Silverstone this year, is the GP or National Circuit your favourite and why? 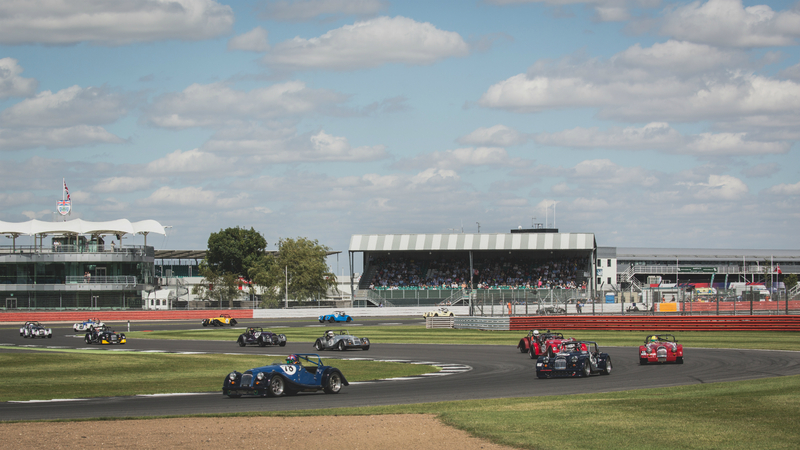 You can never go to Silverstone too many times! 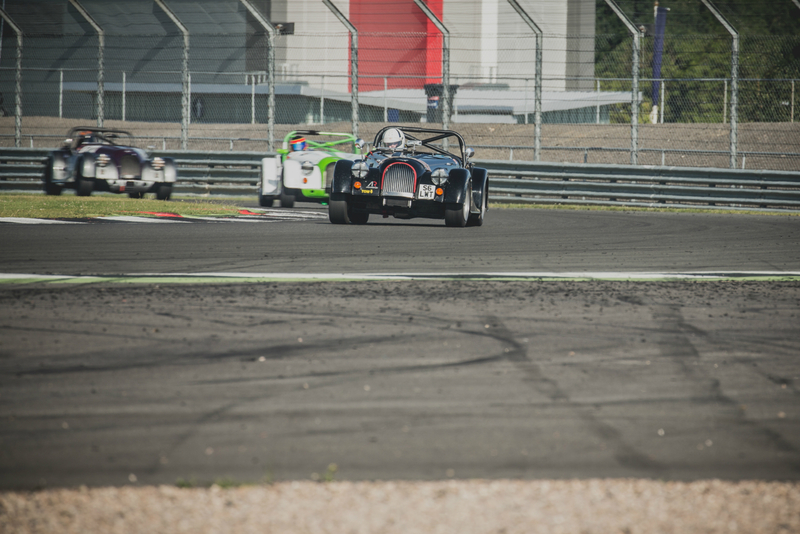 I honestly don’t know which I prefer. 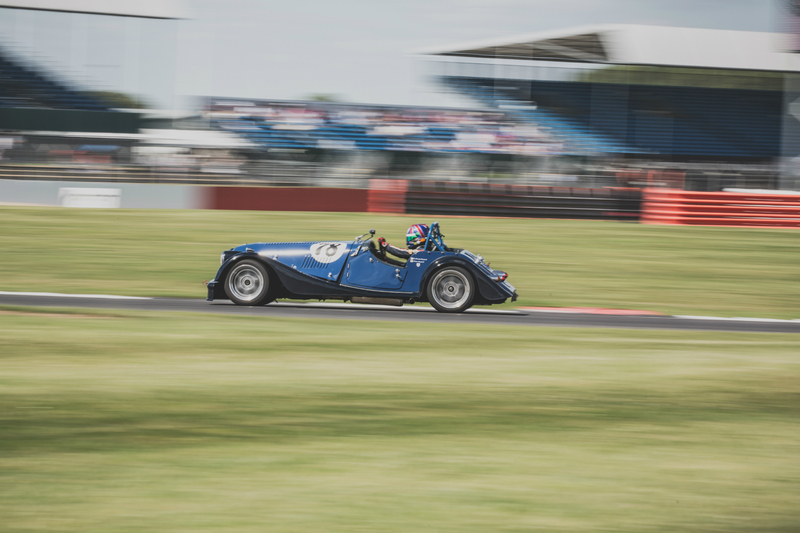 With the large grids we have in the series the National circuit lends itself to being a bit more fun, you’re always passing back markers which makes racing those around you challenging. 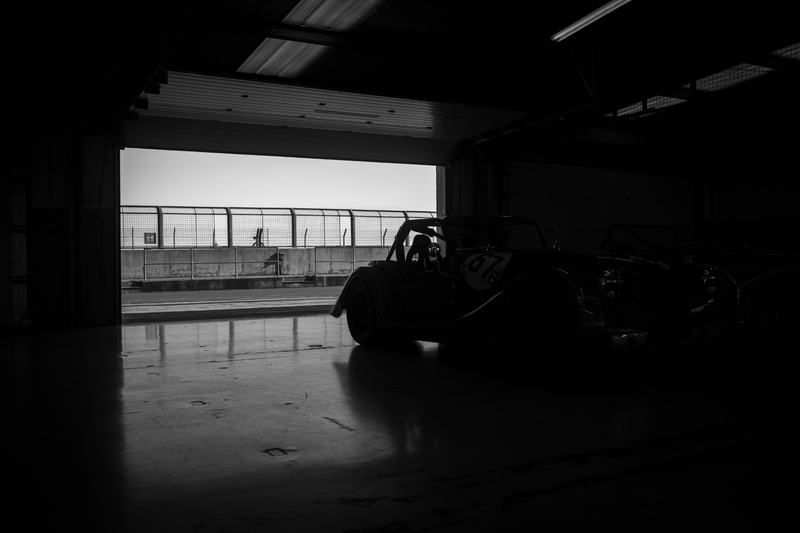 Even though it won’t stand as it was in qualifying, your 1:05 lap was a record and you qualified 1st. 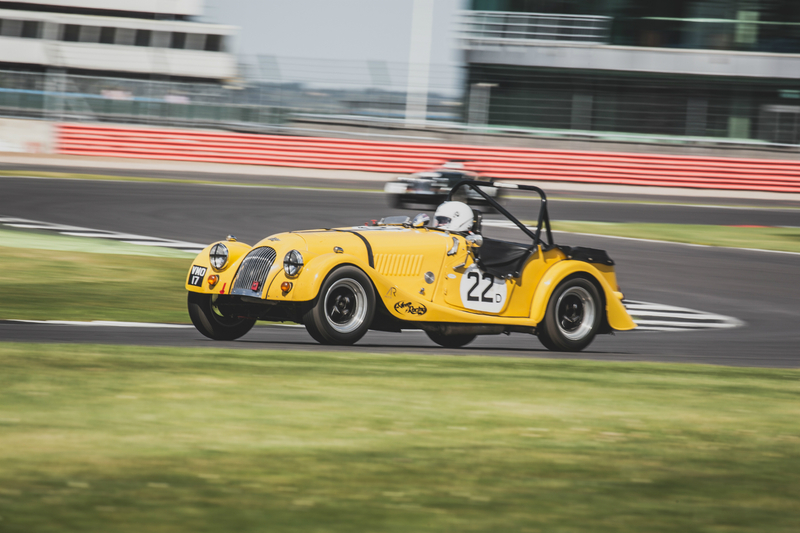 How and why did it go so well? 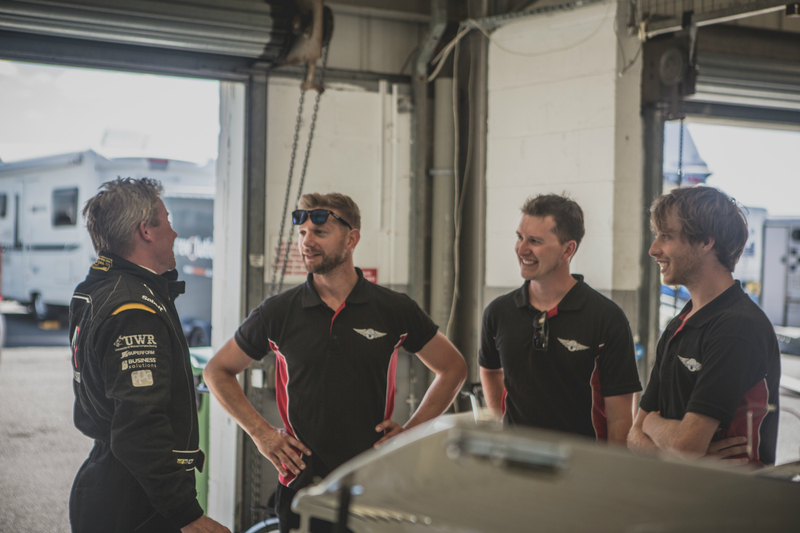 I have absolutely no idea! 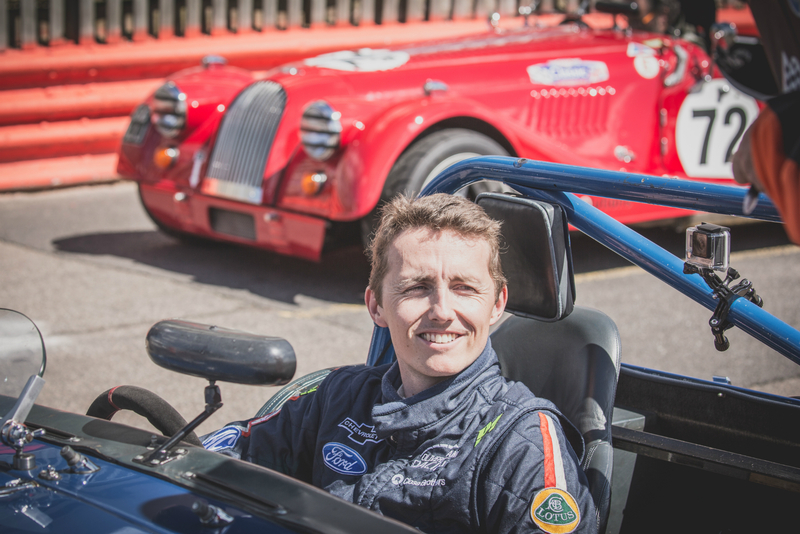 I was confident as I know we have real pace in the car, I was cautious from Angelsey to be precise in my driving rather than throwing the car about as I have done before. 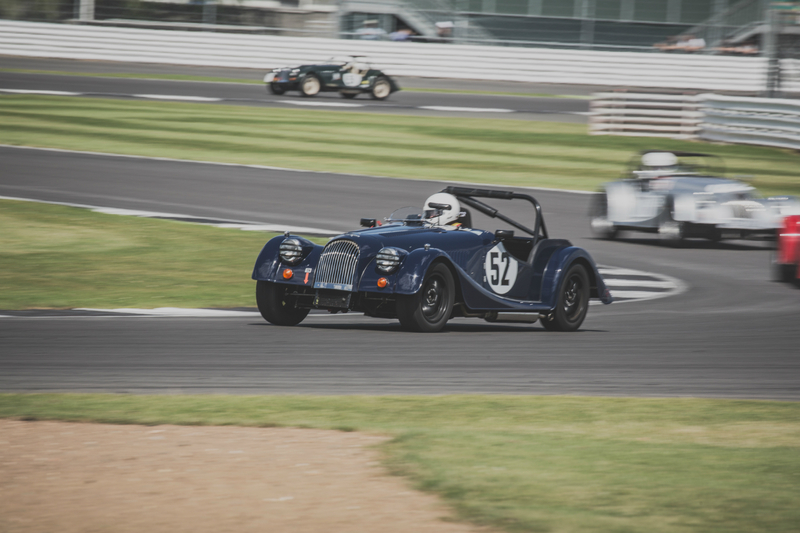 I think the quick lap actually came while I was following Andrew, and his more precise style helped me to brake earlier and exit corners quicker. 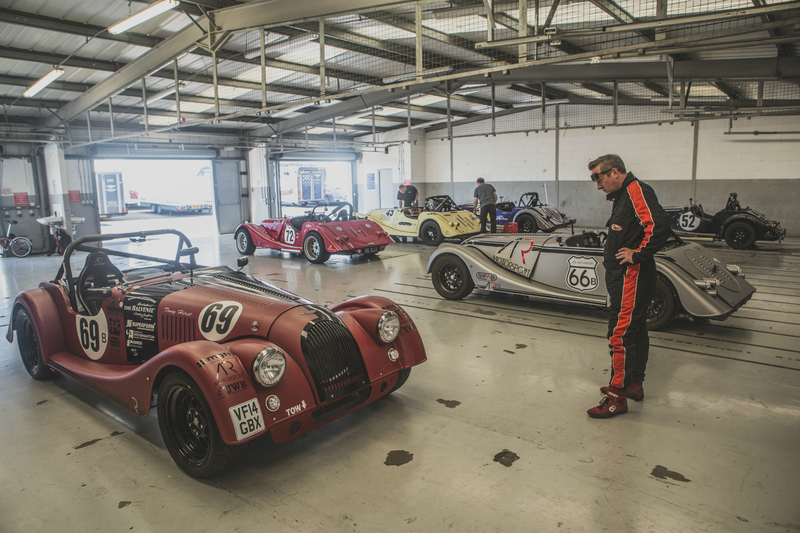 I’ve been working a lot with Shane Kelly about driving styles so it was brilliant to see that quick time posted. 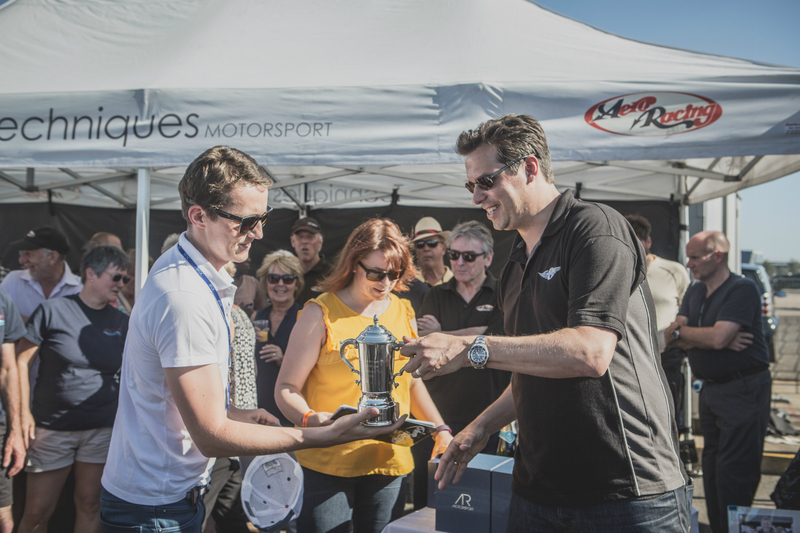 I don’t care if it’s not official, it still happened! 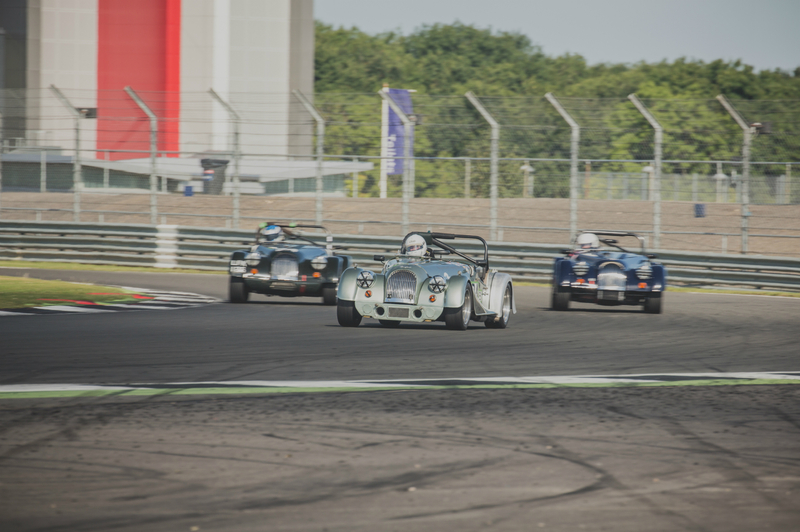 You seemed dissapointed to finish 3rd in the race, which in itself shows progression. 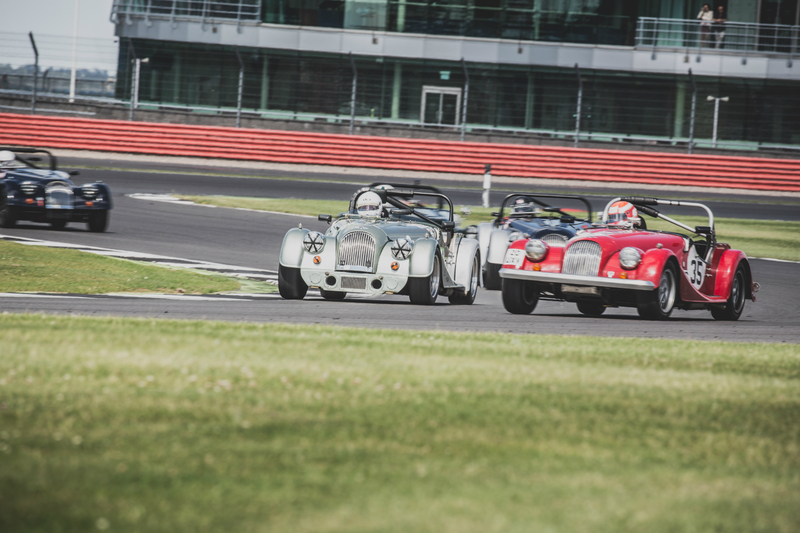 Talk us through your race? 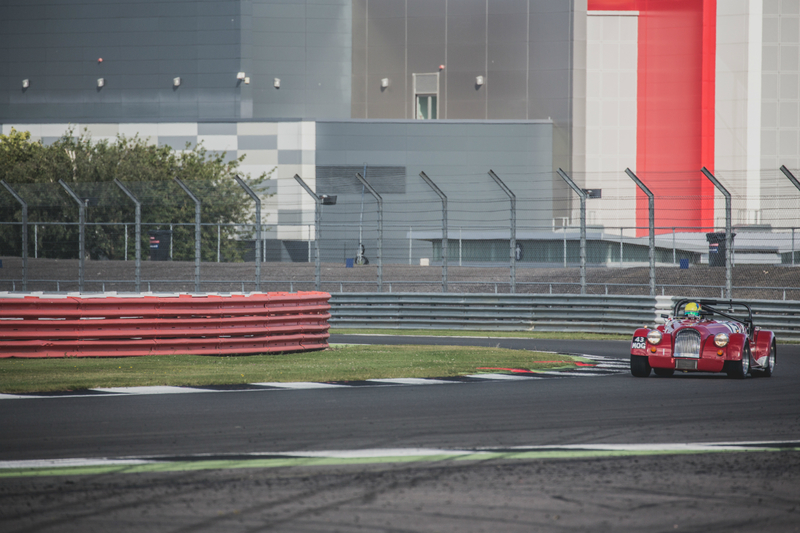 I got a great start from class pole, and took some more class As. 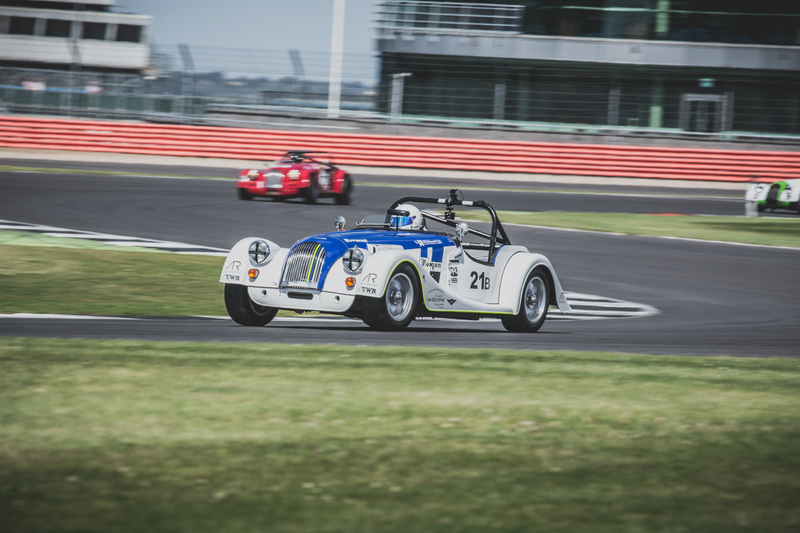 John Emberson was flying and overtook me as well as Elliot. 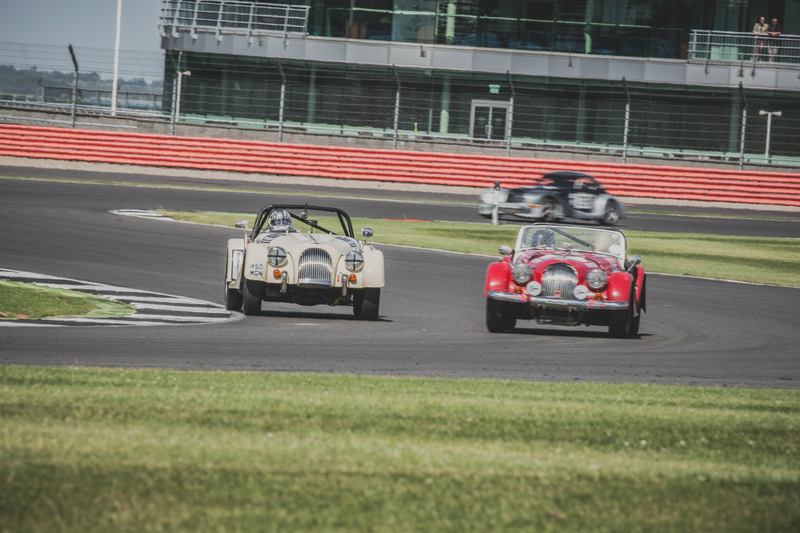 It was me Elliot and Andrew once again battling it out, I was frustrated not to stay ahead of Andrew but I think he remembered where I passed him last time out on the National. 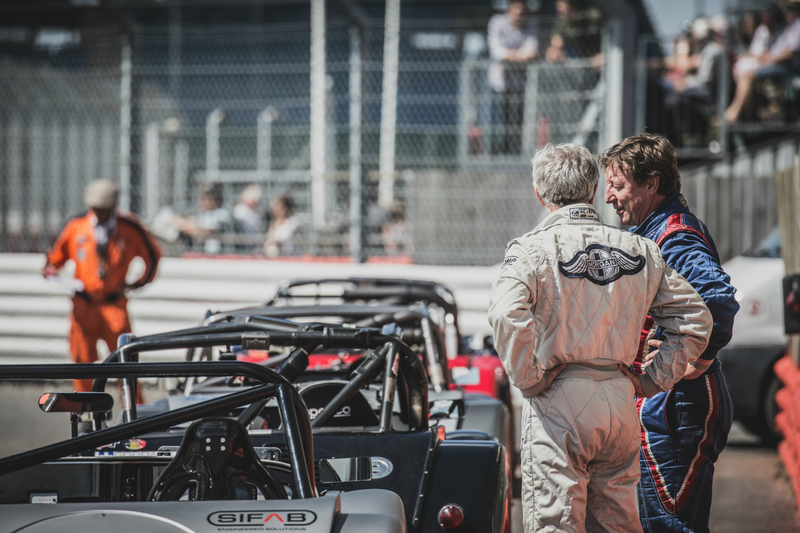 As ever, we were all wheel to wheel racing and the respect between drivers on track is admirable, it’s so good to race that hard knowing you aren’t at risk of being unfairly run off. 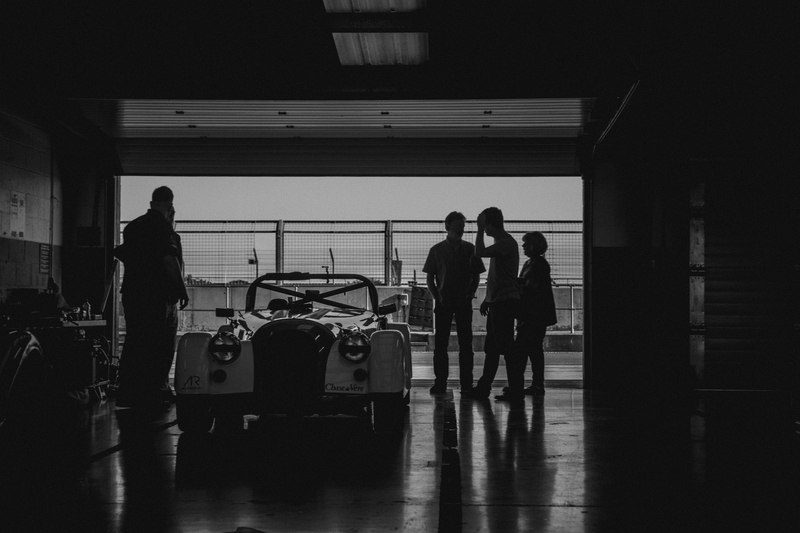 Finally, a word on the BDC meeting and what makes it so special? 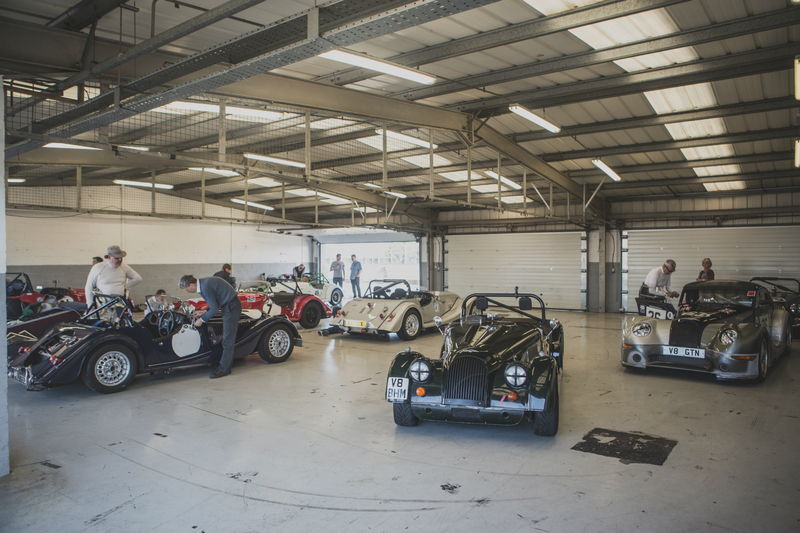 Just the calibre of cars that are there. 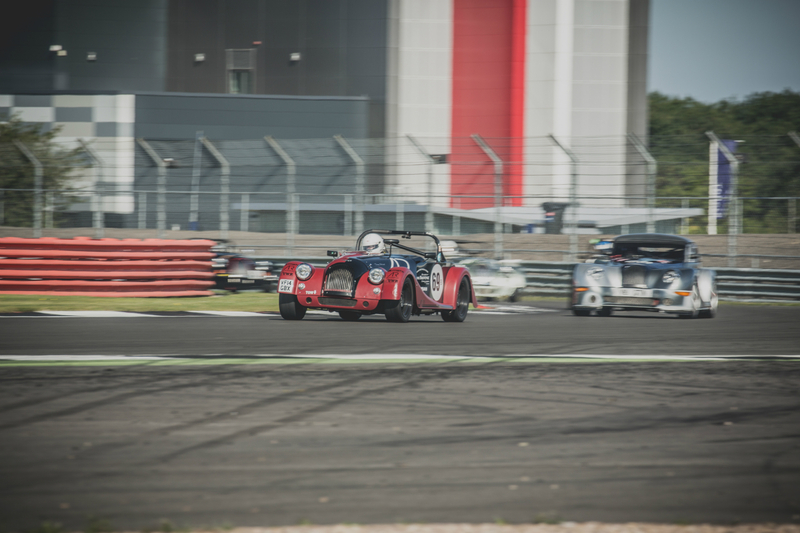 Big Bentleys as well as old Astons, there’s a spirit and a pedigree similar to that of a VSCC event, absolutely lovely. 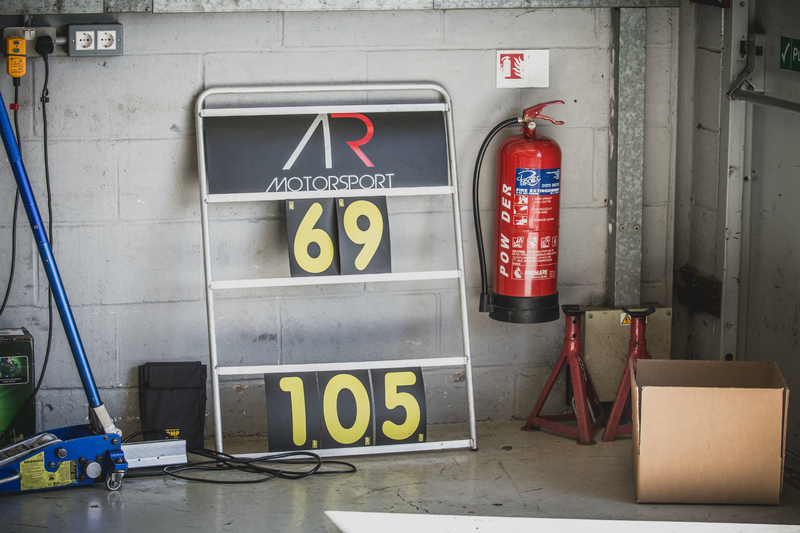 Also, the fact I smashed the lap record helps! 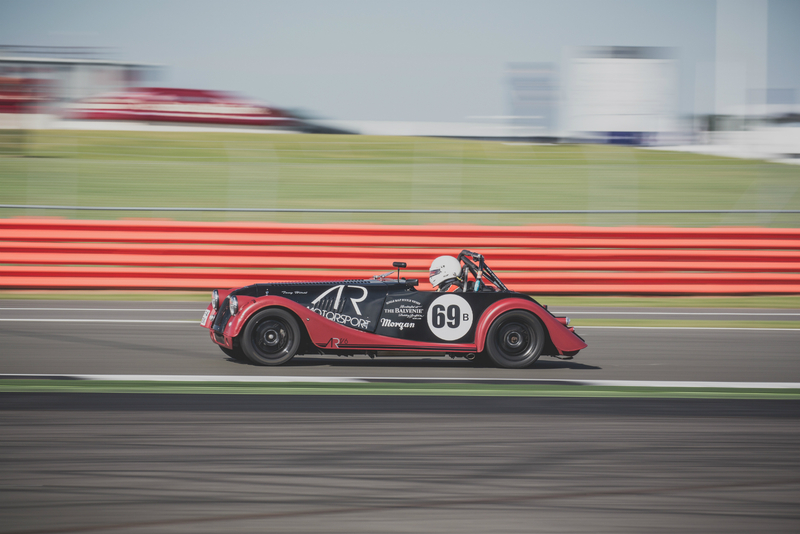 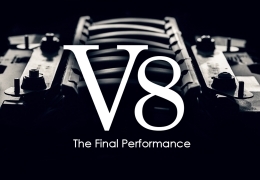 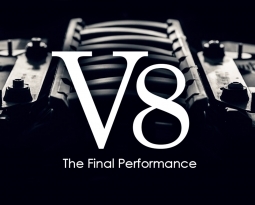 Bio: 2016 is Tony’s 3rd year in the challenge series and his 2nd in the factory prepared ARV6. 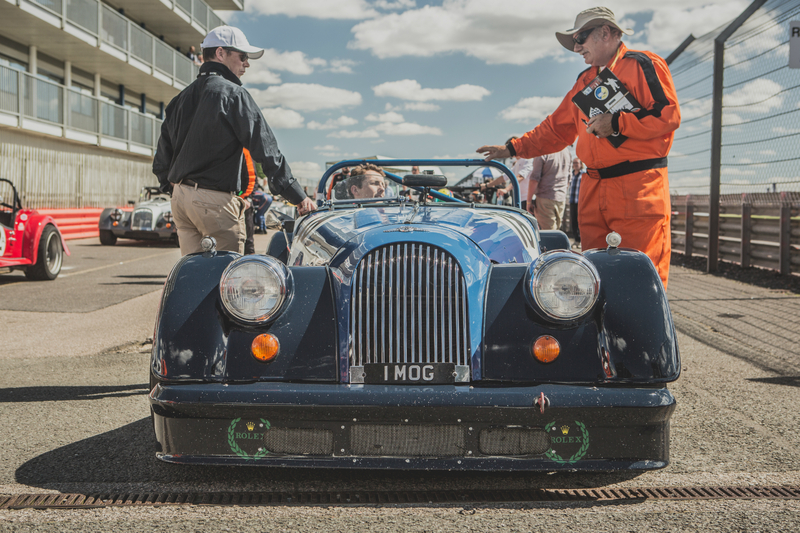 First meeting the Morgan marque at the Silverstone Classic Celebrity Race some years ago, Tony has become more involved with the company and the challenge series ever since. 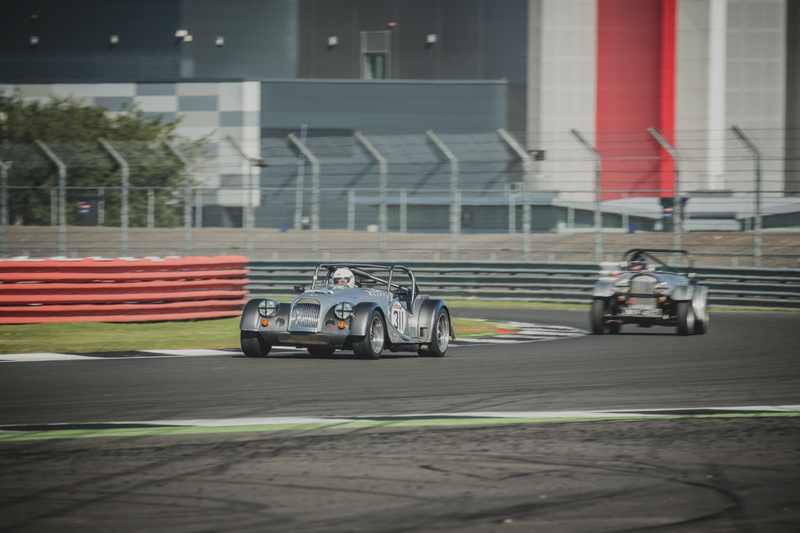 When not on the race track, Tony is an accomplished actor both on stage and on screen.